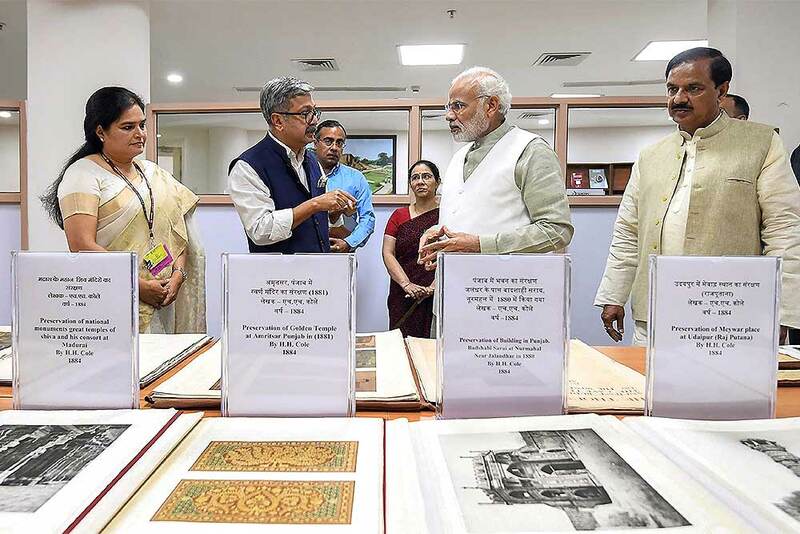 Prime Minister Narendra Modi speaks with Ministry of Culture Secretary Raghvendra Singh at the inauguration of ‘Dharohar Bhawan’, the new building of Archaeological Survey of India, at Tilak Marg, in New Delhi. Union Minister of State for Culture and Tourism Dr. Mahesh Sharma and ASI Director-General Usha Sharma is also seen. 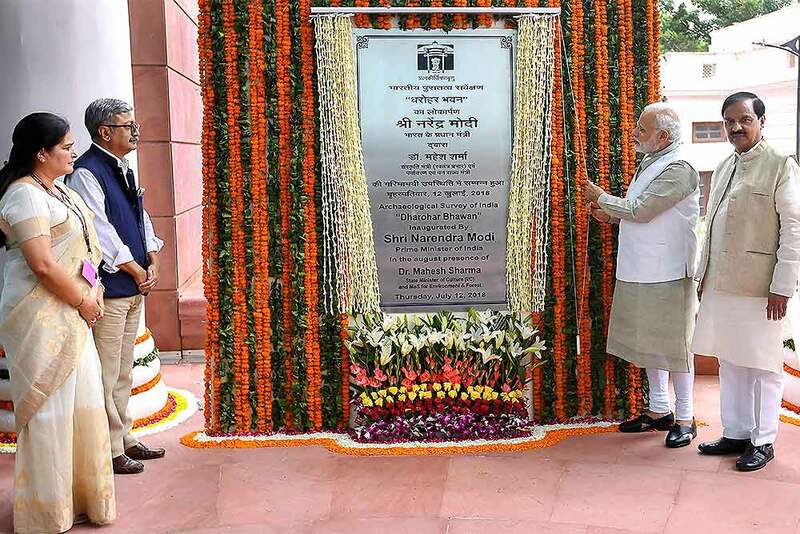 Prime Minister Narendra Modi unveils the plaque during the inauguration of ‘Dharohar Bhawan’, the new building of Archaeological Survey of India, at Tilak Marg, in New Delhi. 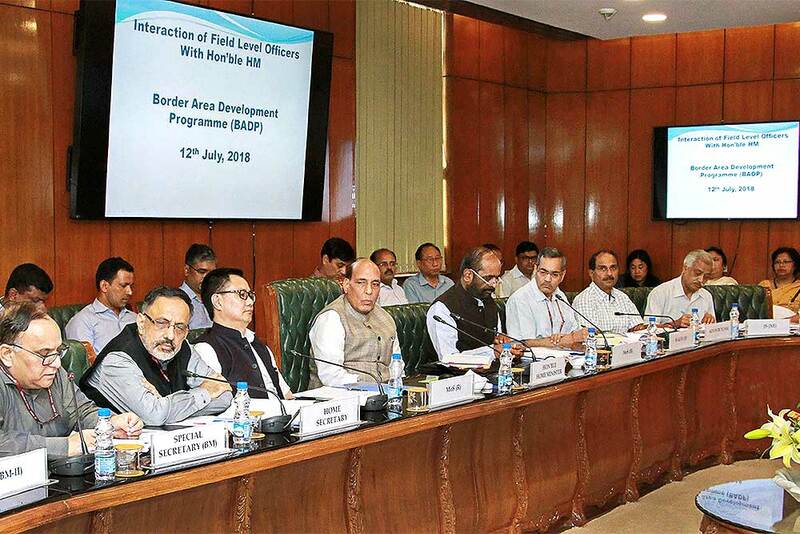 Union Home Minister Rajnath Singh during an interaction with the field level officers to review the Border Area Development Programme (BADP), in New Delhi. Ministers of State for Home Affairs Hansraj Gangaram Ahir and Kiren Rijiju are also seen. 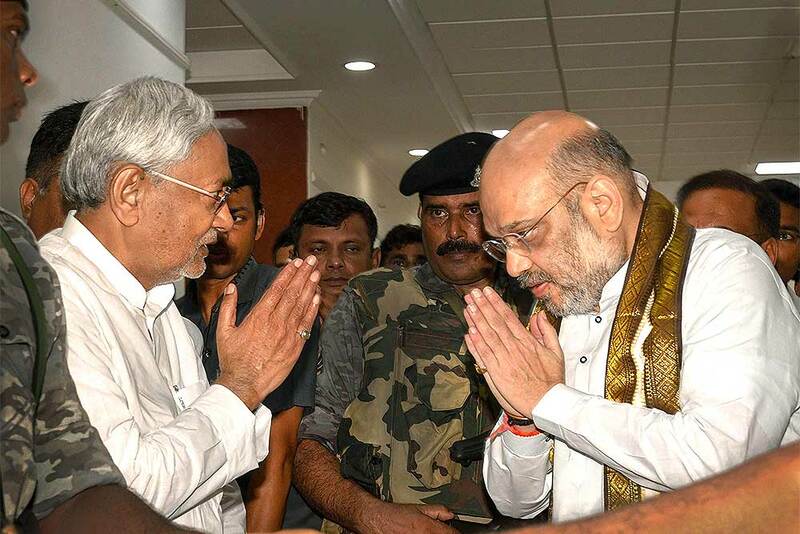 Bihar Chief Minister Nitish Kumar and Bharatiya Janata Party (BJP) President Amit Shah exchange greetings before a breakfast meeting at the state guest house, in Patna. 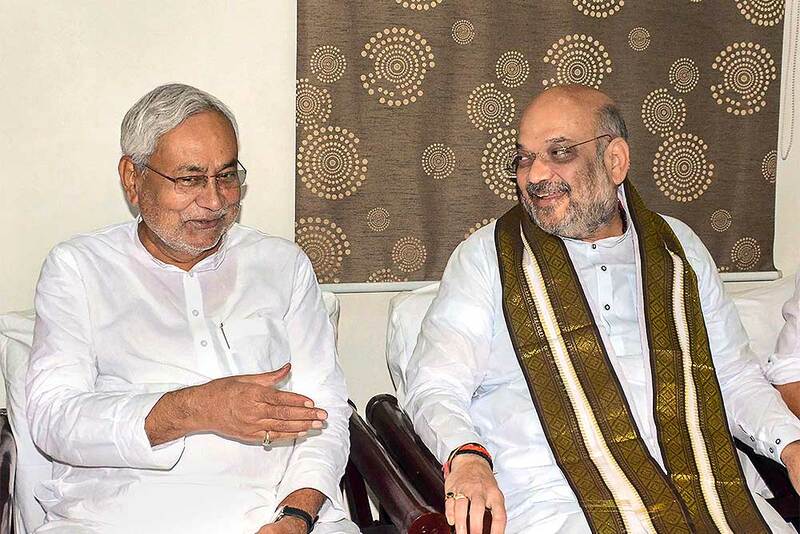 Bihar Chief Minister Nitish Kumar and Bharatiya Janata Party (BJP) President Amit Shah at a breakfast-meeting at the state guest house, in Patna. 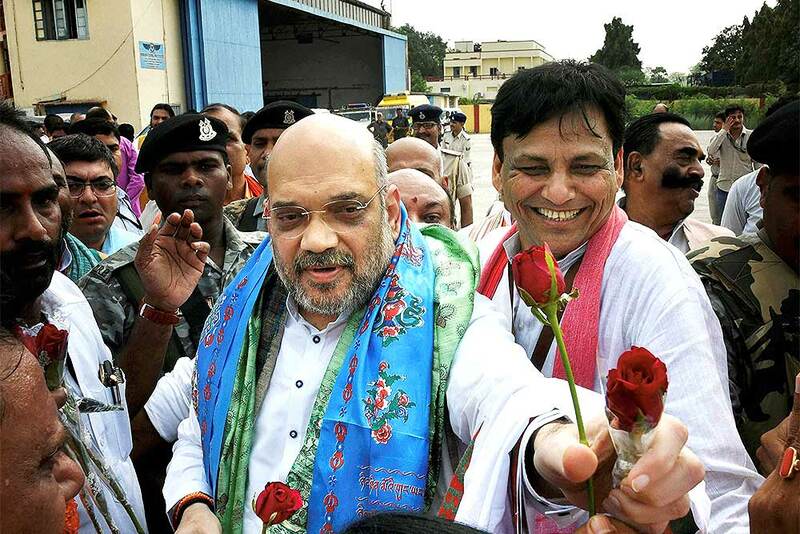 Bharatiya Janata Party (BJP) President Amit Shah being welcomed by the supporters on his arrival at Jai Prakash Narayan Airport, in Patna. 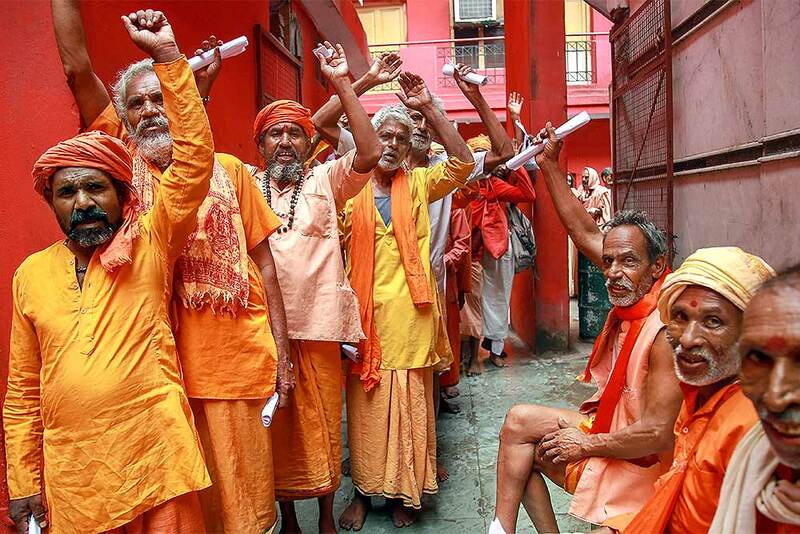 Sadhus chant religious slogans while standing in a queue to get themselves registered for Amarnath Yatra at a base camp, in Jammu. 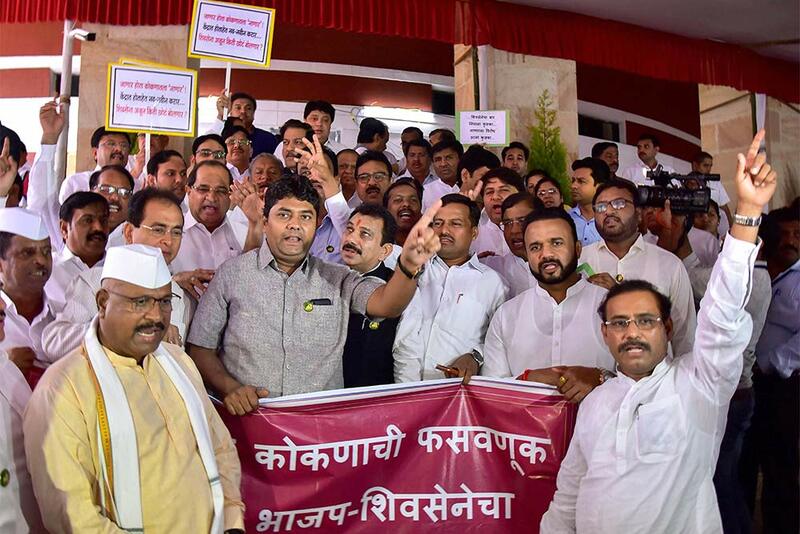 Congress and NCP MLAs shout slogans outside the Vidhan Bhawan during a protest against Nanar Refinery Project on the seventh day of the monsoon session of Maharashtra State Assembly, in Nagpur. Miss India 2018 Winner Anukreethy Vas with Meenakshi Chaudhary (1st Runner up) and Shreya Rao (2nd Runner up) at the NRI of the Year Awards function, in Mumbai. 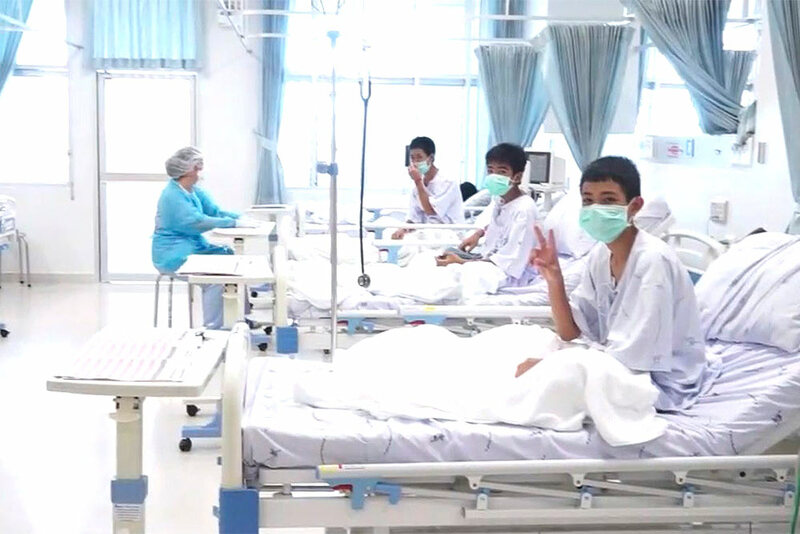 In this image made from video, released by the Thailand Government Spokesman Bureau, three of the 12 boys are seen recovering in their hospital beds after being rescued along with their coach from a flooded cave in Mae Sai, Chiang Rai province, northern Thailand. 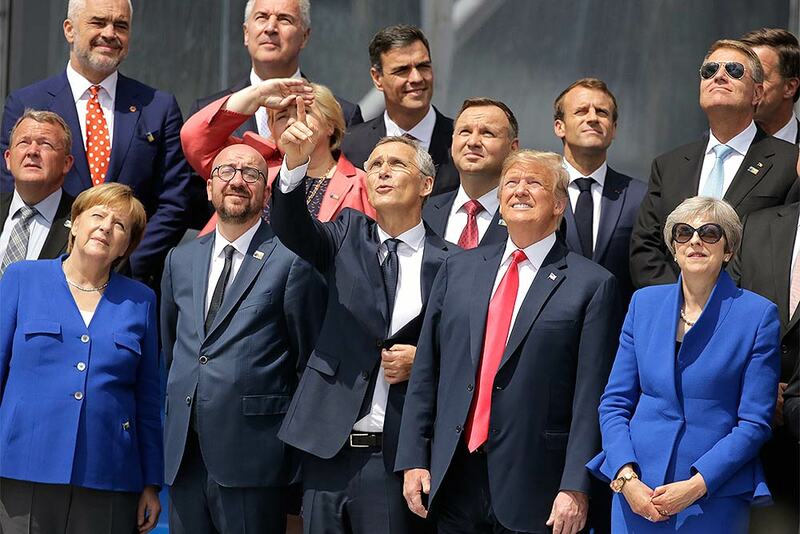 German Chancellor Angela Merkel, Belgian Prime Minister Charles Michel, NATO Secretary-General Jens Stoltenberg, U.S. President Donald Trump and British Prime Minister Theresa May, front row from left, watch a fly-by during a summit of heads of state and government at NATO headquarters in Brussels. NATO leaders gather in Brussels for a two-day summit to discuss Russia, Iraq and their mission in Afghanistan. 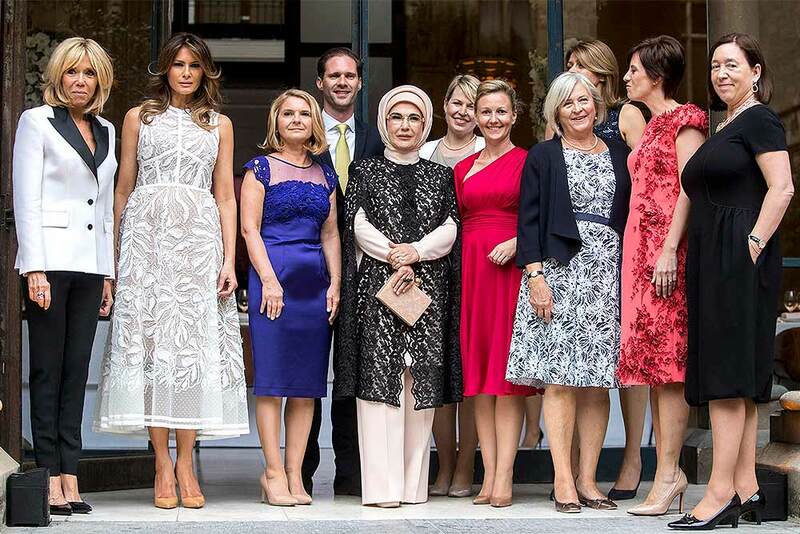 From left, French First lady Brigitte Macron, US First Lady Melania Trump, Malgorzata Tusk, Husband of Luxembourg's prime minister Gauthier Destenay, First Lady of Turkey Emine Gulbaran Erdogan, Partner of Estonia's Prime Minister Karin Ratas, Partner of Slovenia's Prime Minister Mojca Stropnik, Partner of Sweden's Prime Minister Ulla Lofven, Partner of Bulgaria's President Desislava Radeva, Belgian Prime Minister Michel's partner Amelie Derbaudrenghien and NATO Secretary General Stoltenberg's partner Ingrid Schulerud pose ahead of a NATO spouses dinner at Jubilee Museum in Brussels, Belgium. 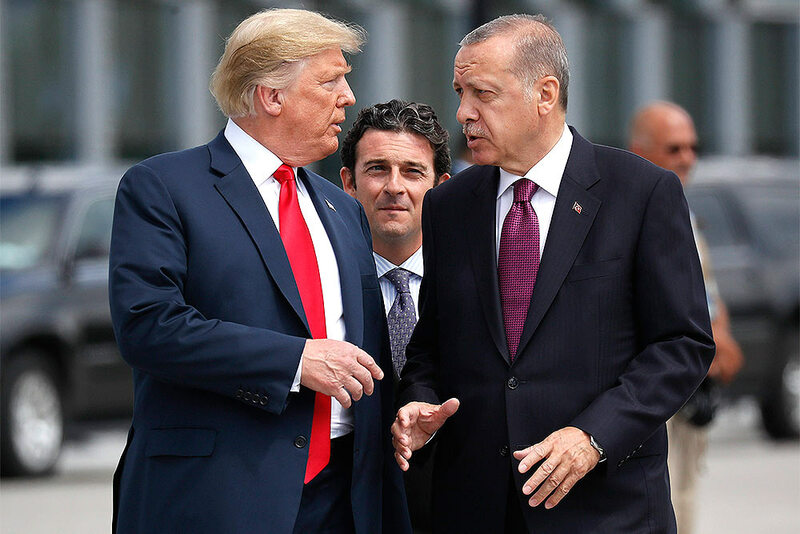 President Donald Trump, left, talks with Turkey's President Recep Tayyip Erdogan, right, as they arrive together for a family photo at a summit of heads of state and government at NATO headquarters in Brussels. 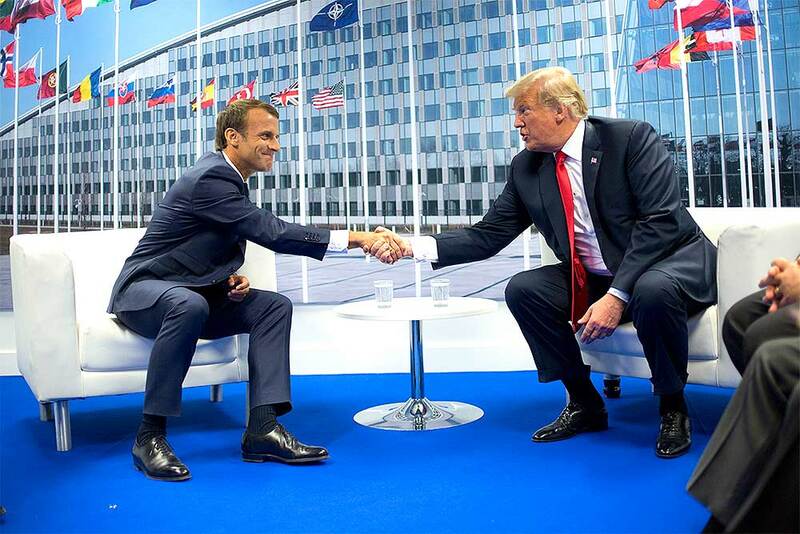 President Donald Trump and French President Emmanuel Macron shake hands during their bilateral meeting in Brussels, Belgium. 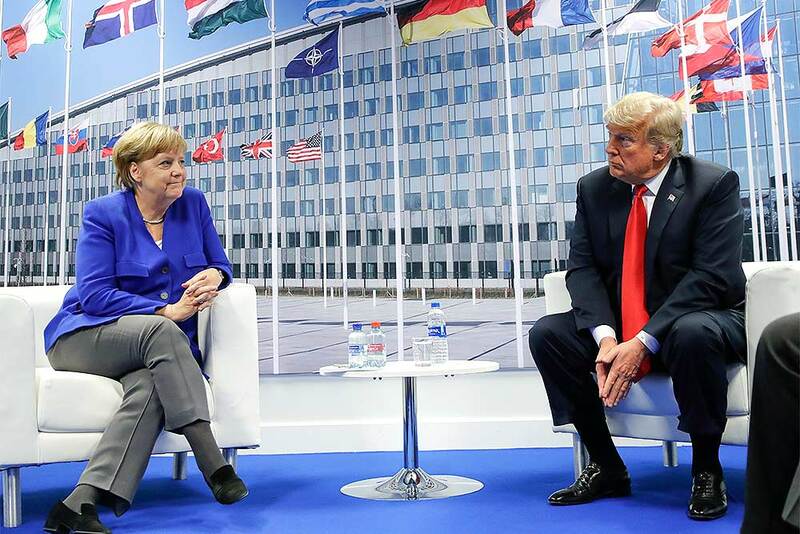 President Donald Trump and German Chancellor Angela Merkel during their bilateral meeting in Brussels, Belgium. 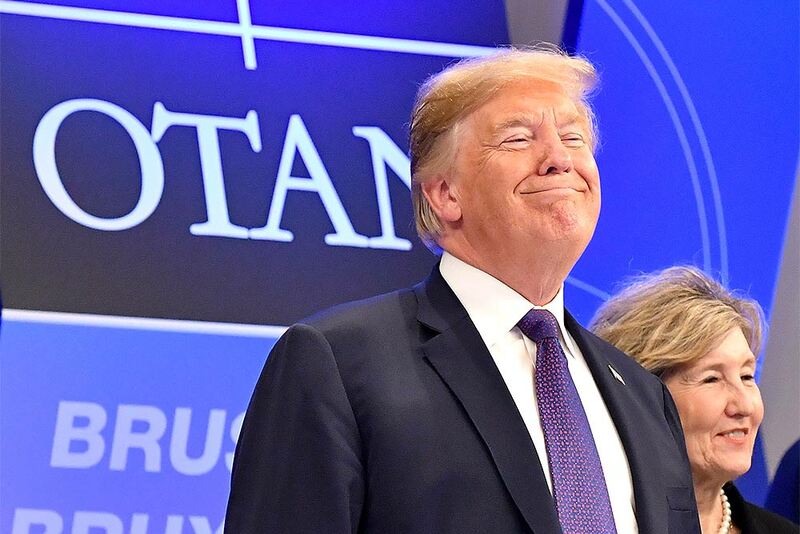 U.S. President Donald Trump smiles prior to a dinner of leaders at the Art and History Museum at the Park Cinquantenaire in Brussels. NATO leaders gathered in Brussels for a two-day summit to discuss Russia, Iraq and their mission in Afghanistan. Leaders gather during a dinner at the Art and History Museum at the Park Cinquantenaire in Brussels. 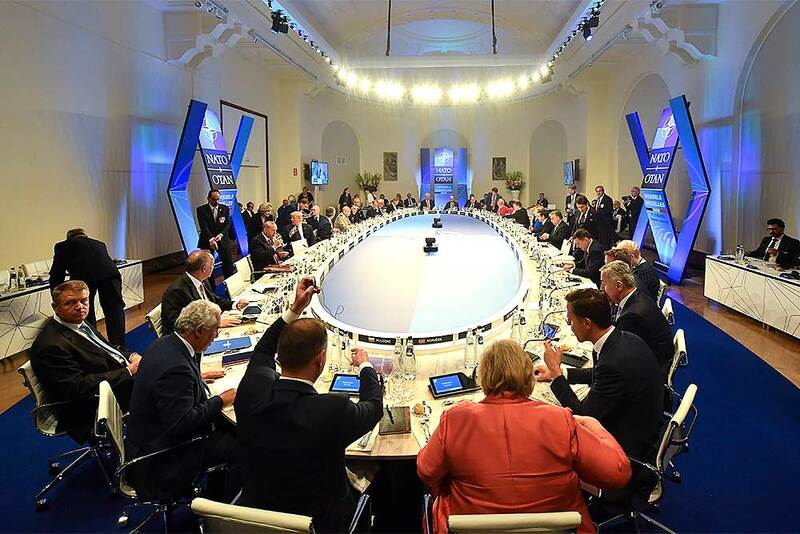 NATO leaders gathered in Brussels for a two-day summit to discuss Russia, Iraq and their mission in Afghanistan. 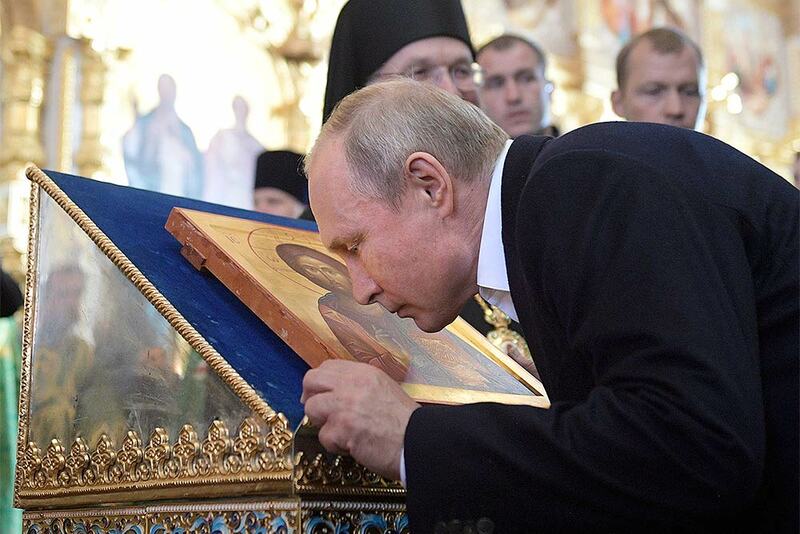 Russian President Vladimir Putin kisses an icon while visiting the Valaam Monastery of the Transfiguration of the Savior on the Day of Saints Sergius and Herman of Valaam on Valaam island in northwest Russia close to the Finnish border in Valaam, Russia. Photojournalists from Argentina's national press photographers association ARGRA hold up their cameras and shout slogans outside Telam, a national news agency, to protest the layoffs of some 350 Telam journalists who are now occupying the agency's headquarters, in Buenos Aires, Argentina. 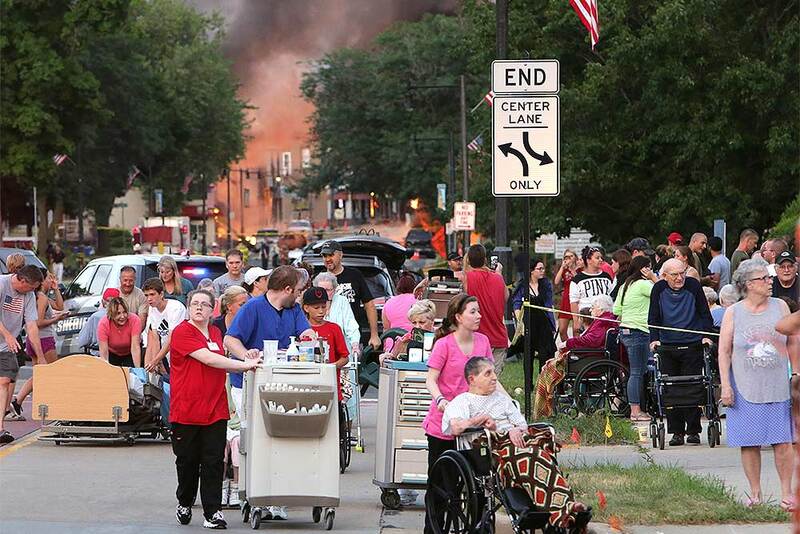 People evacuate as they were told to move farther away the scene of an explosion in downtown Sun Prairie, Wisconsin. 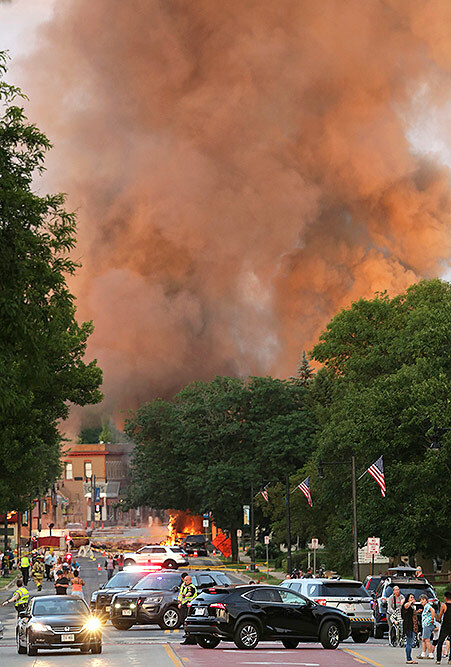 The explosion rocked the downtown area of Sun Prairie, a suburb of Madison, after a contractor struck a natural gas main Monday, sending an unknown number of people to hospitals, authorities said. Police officers shut down a street as firefighters work the scene of an explosion in downtown Sun Prairie, Wisconsin. 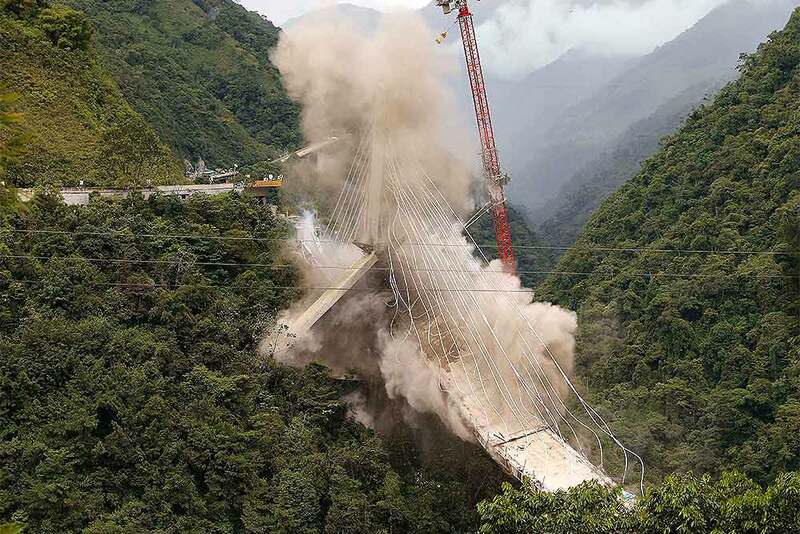 A partially-built suspension bridge is demolished by engineers in Chirajara, Colombia. One part of the bridge collapsed in January during its construction, killing at least nine workers. 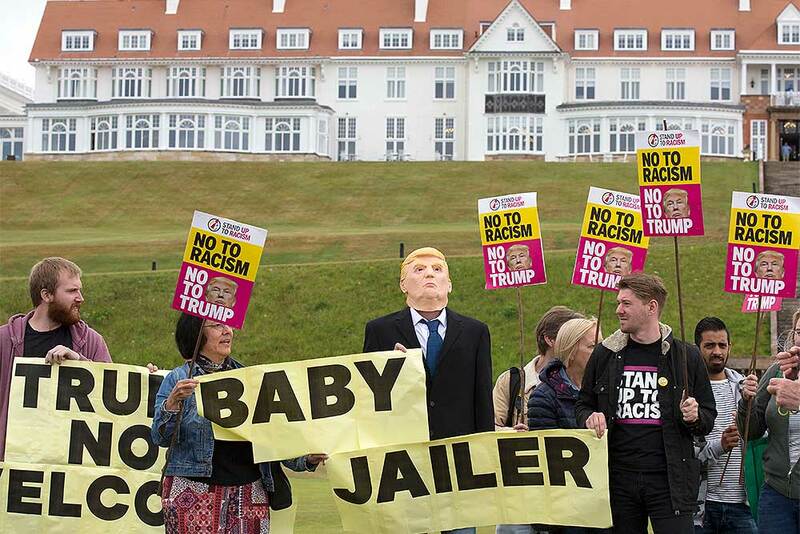 Activists from Stand Up to Racism Scotland (SUTR) stage a protest at the Trump Turnberry resort ahead of the US president's arrival in the UK, in South Ayrshire, Scotland. 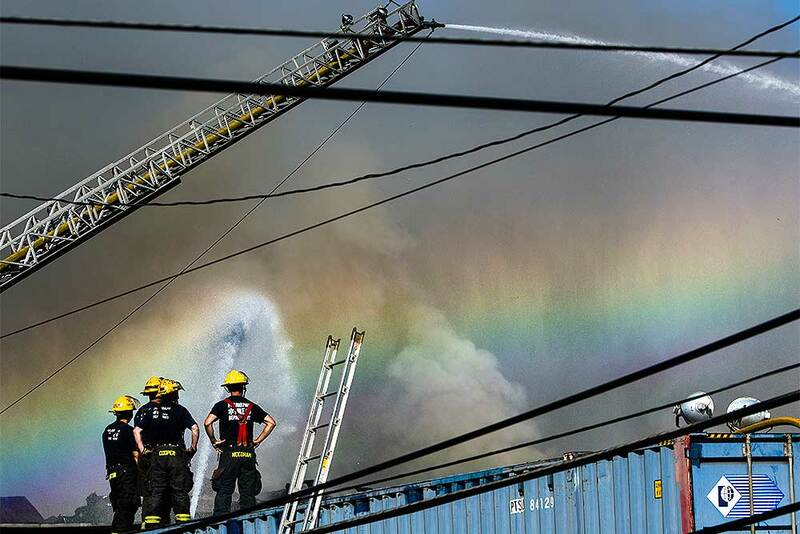 Authorities work to extinguish a junkyard fire in the Kensington neighborhood of Philadelphia. The fire was reported around 8:30 p.m. Tuesday and spewed thick smoke and flames that could be seen for miles. Authorities say the burning materials consisted mainly of metal, wood and paper. Protesters chains themselves outside the Ministry of Transport in Rome. Dozens of protesters chained themselves to the steps in a demonstration against the government's hard-line immigration policy. 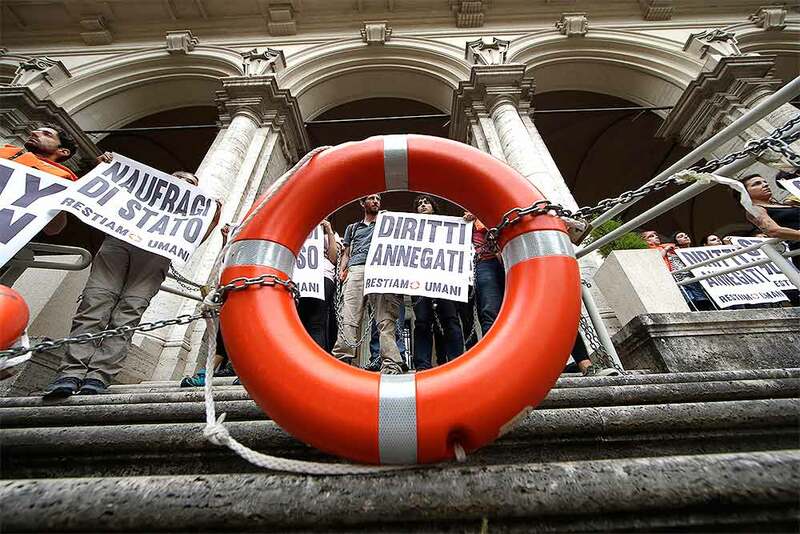 Writing on Italian signs reads "State shipwrecks, right to rescue, drowned rights." 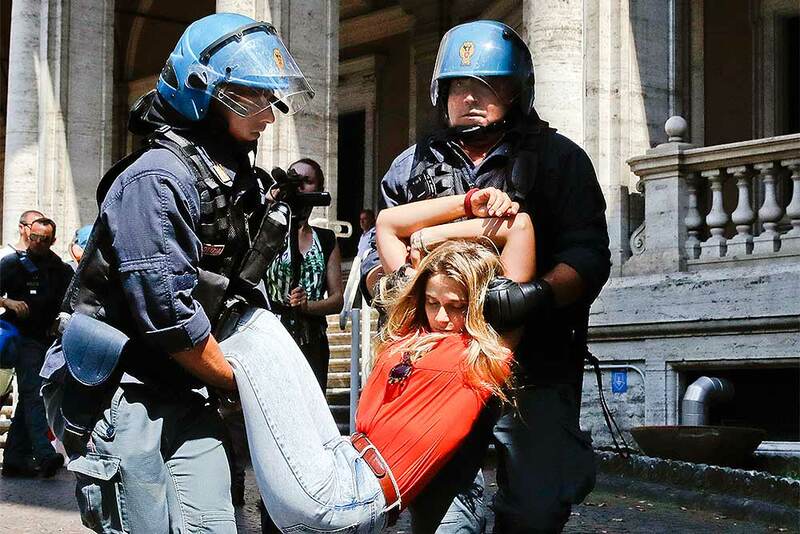 A protester is dragged away by Italian police outside the Ministry of Transport in Rome. Dozens of protesters chained themselves to the steps in a demonstration against the government's hard-line immigration policy. 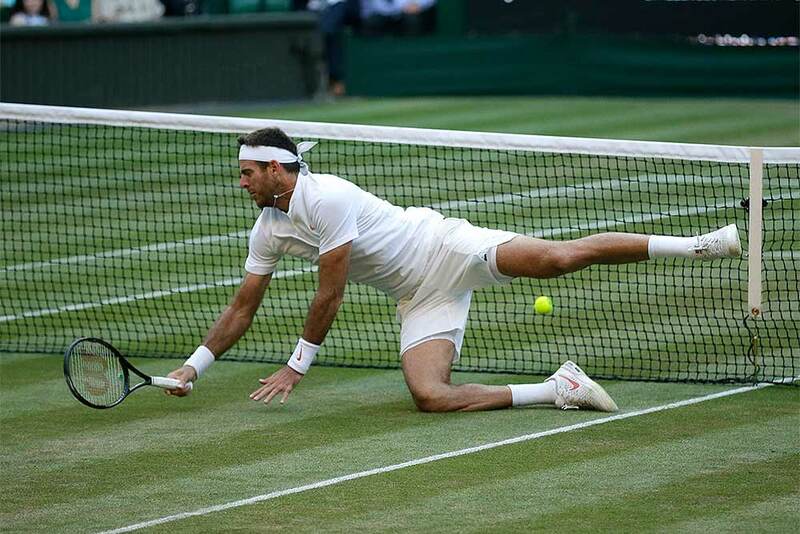 Juan Martin Del Potro of Argentina falls on the court during the men's quarterfinal match against Rafael Nadal of Spain at the Wimbledon Tennis Championships in London. 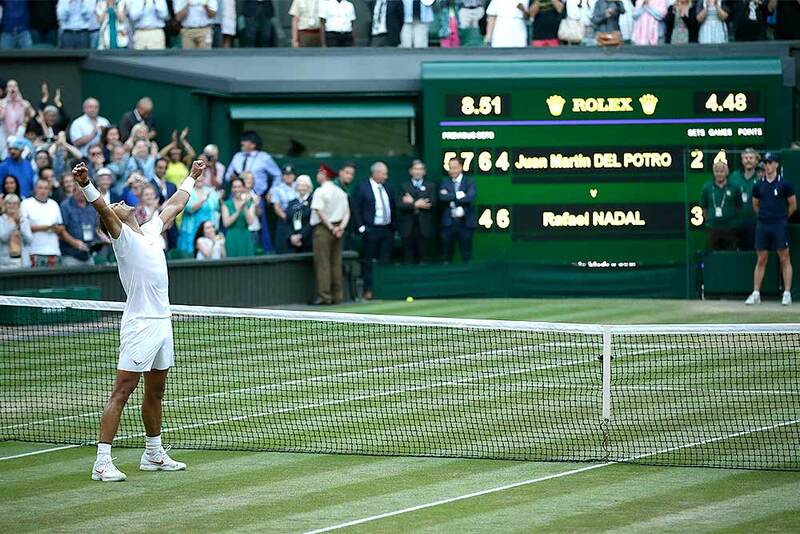 Rafael Nadal of Spain celebrates defeating Juan Martin Del Potro of Argentina in their men's quarterfinal match at the Wimbledon Tennis Championships in London. 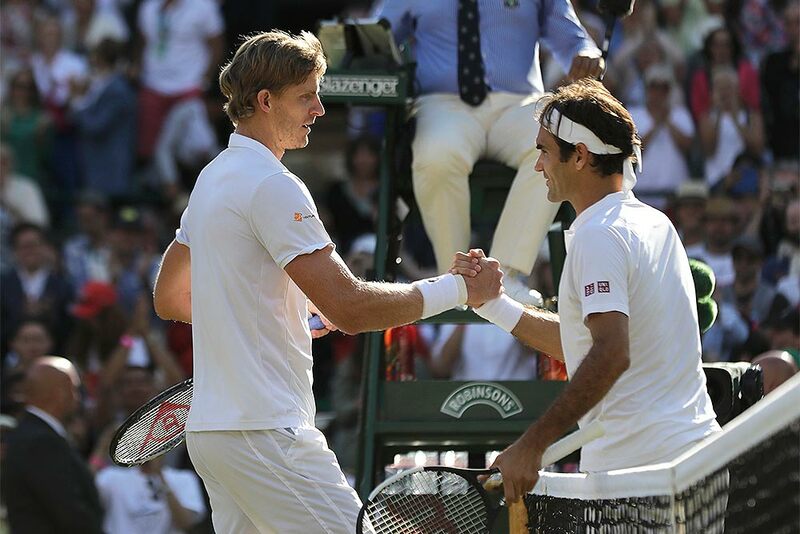 Kevin Anderson of South Africa, left, shakes hands with Switzerland's Roger Federer, after defeating him in their men's quarterfinals match at the Wimbledon Tennis Championships, in London. 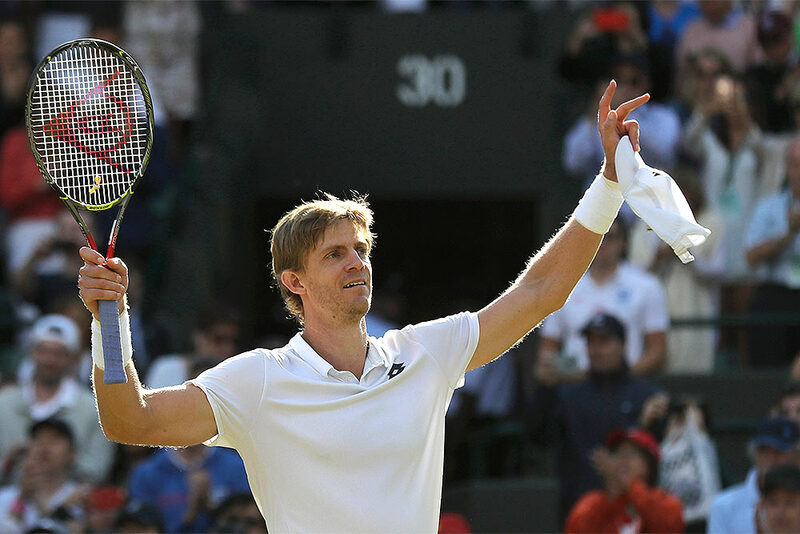 Kevin Anderson of South Africa celebrates winning his men's quarterfinals match against Switzerland's Roger Federer, at the Wimbledon Tennis Championships, in London. 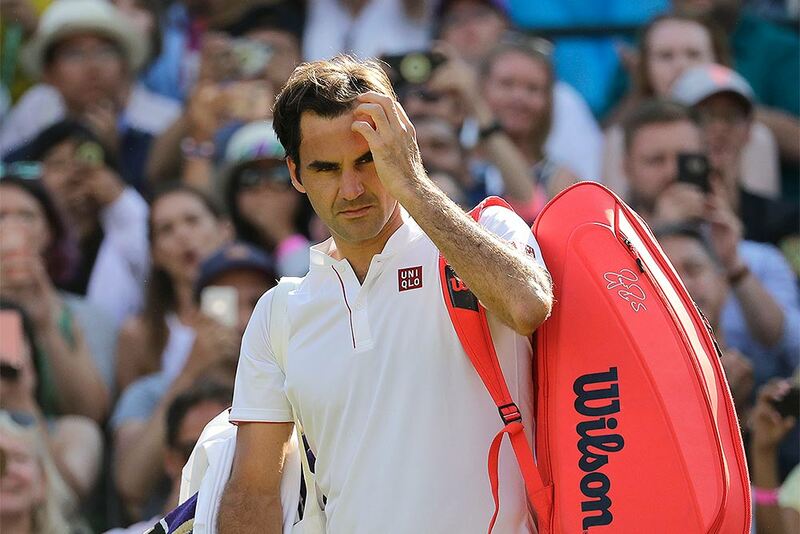 Switzerland's Roger Federer prepares to leave the court after losing his men's quarterfinals match against Kevin Anderson of South Africa, at the Wimbledon Tennis Championships, in London. 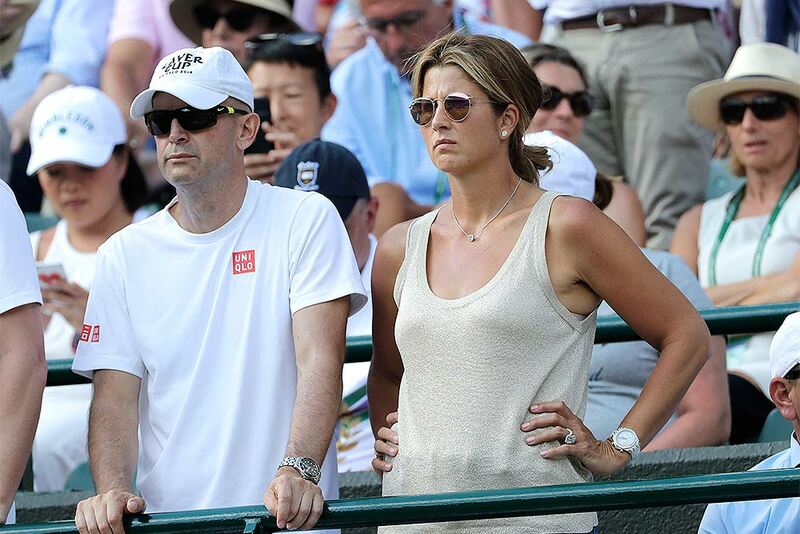 Mirka Federer, wife of, Switzerland's Roger Federer watches from the stands after he lost his men's quarterfinals match against Kevin Anderson of South Africa, at the Wimbledon Tennis Championships, in London. 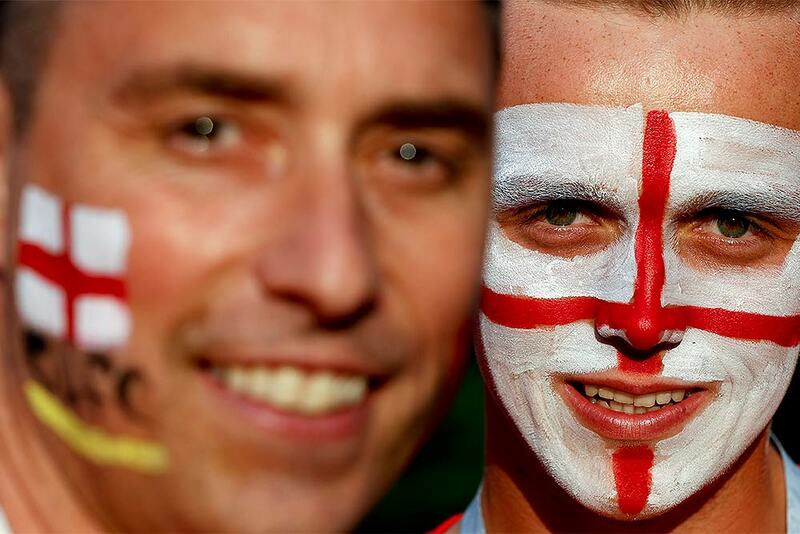 England fans pose for a picture before the semifinal match between Croatia and England at the 2018 soccer World Cup in the Luzhniki Stadium in Moscow, Russia. Russia's soccer fan is painted her face in Croatia's national flag after Croatia won the semifinal soccer match between Croatia and England during the 2018 soccer World Cup at the Luzhniki stadium, in Nikolskaya street near the Kremlin in Moscow, Russia. 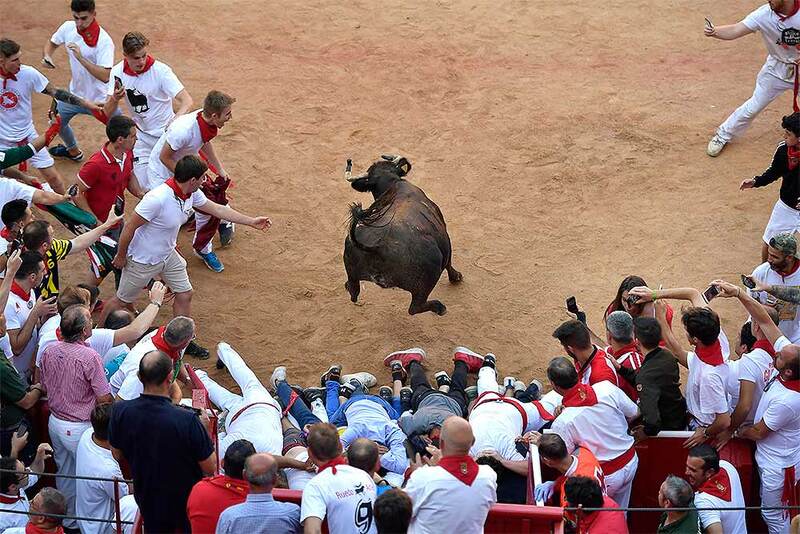 A calf jumps over revellers entering at the bullring after the 5th day of the running of the bulls at the San Fermin Festival in Pamplona, northern Spain. 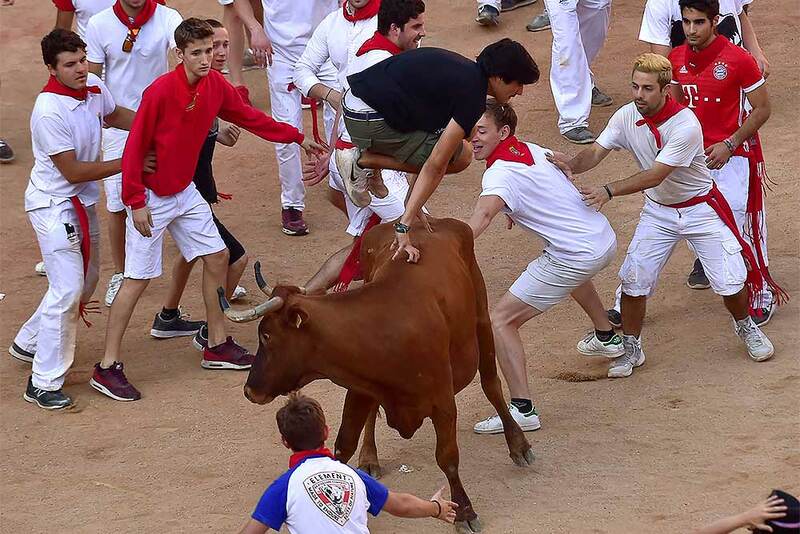 A reveller jumps over a heifer or young bull, following the running of the bulls at the San Fermin Festival in Pamplona, northern Spain. 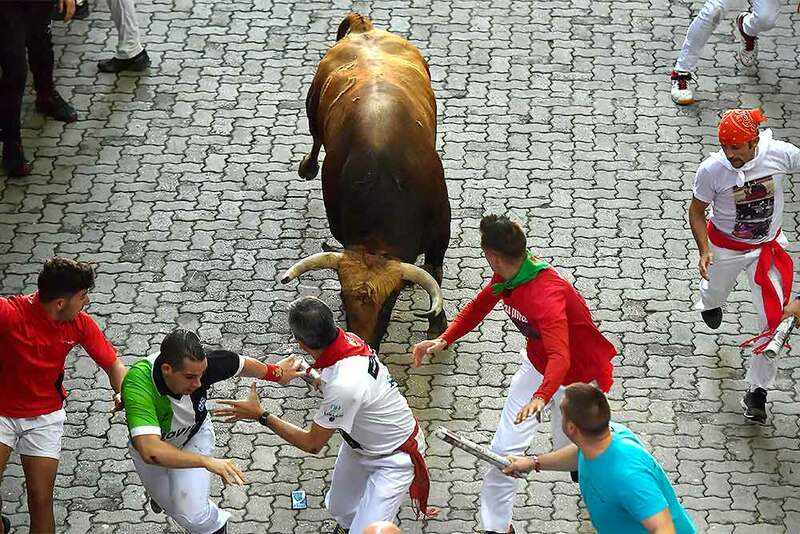 Revellers run next to fighting bulls from the Nunez del Cuvillo bull ranch during 5th day of the running of the bulls at the San Fermin Festival in Pamplona, northern Spain. 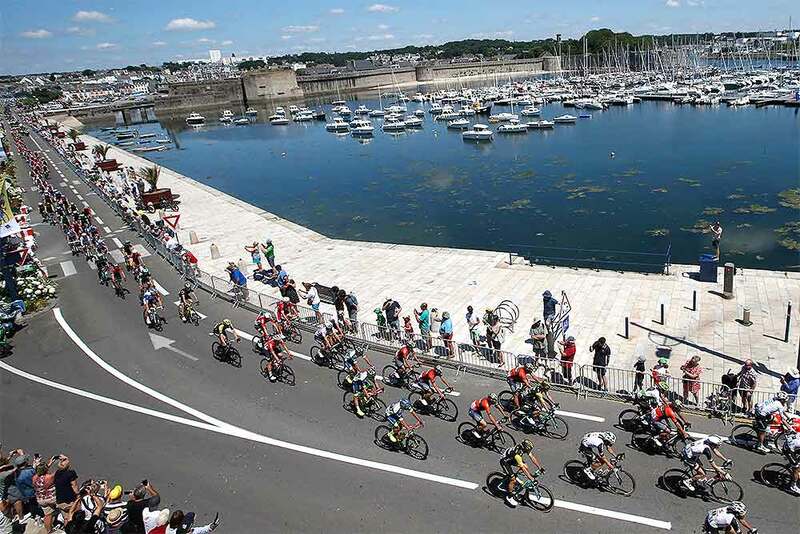 The pack passes through Concarneau during the fifth stage of the Tour de France cycling race over 204.5 kilometers (127 miles) with start in Lorient and finish in Quimper, France. 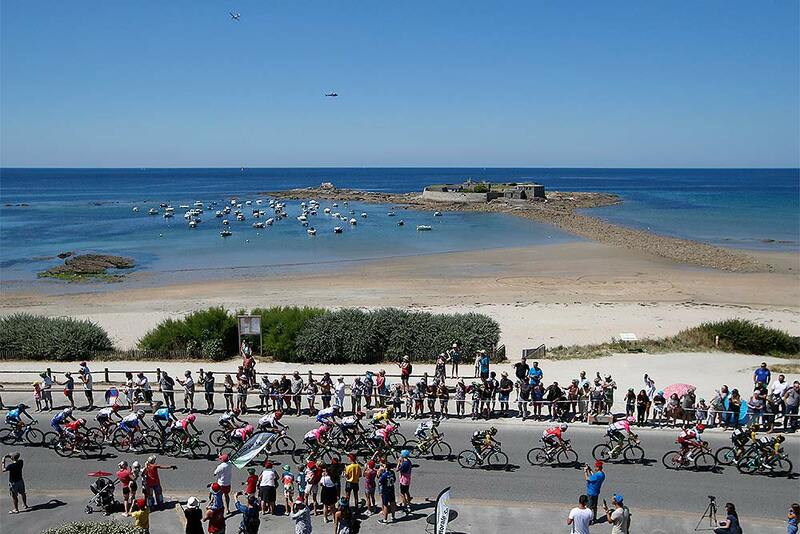 The pack pedals during the fifth stage of the Tour de France cycling race over 204.5 kilometers (127 miles) with start in Lorient and finish in Quimper, France. 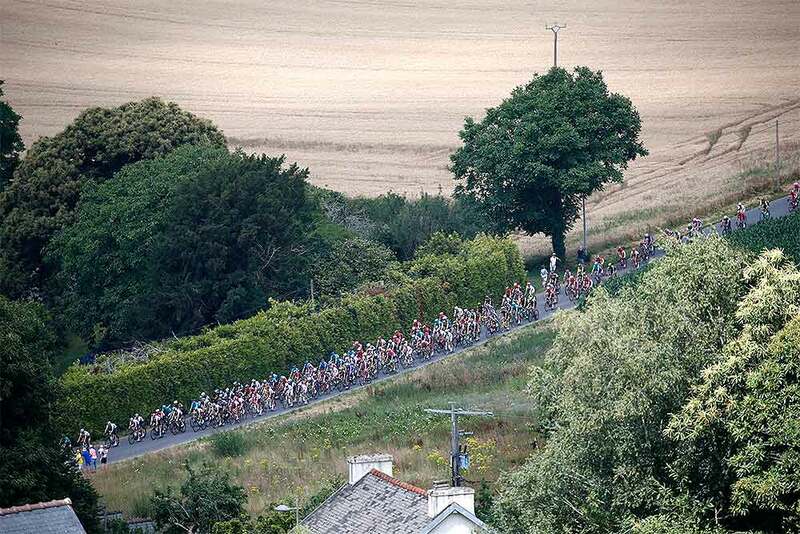 The pack rides during the fifth stage of the Tour de France cycling race over 204.5 kilometers (127 miles) with start in Lorient and finish in Quimper, France. 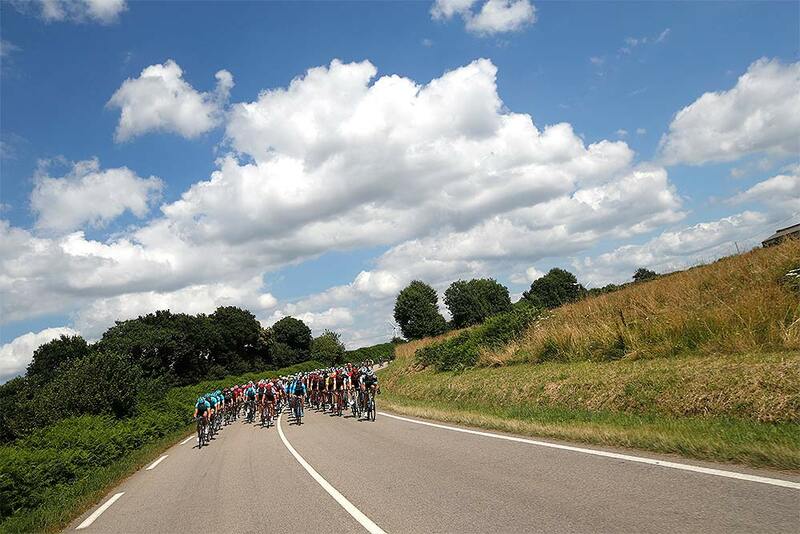 The pack with Belgium's Greg van Avermaet, wearing the overall leader's yellow jersey, passes along the west coast during the fifth stage of the Tour de France cycling race over 204.5 kilometers (127 miles) with start in Lorient and finish in Quimper, France. 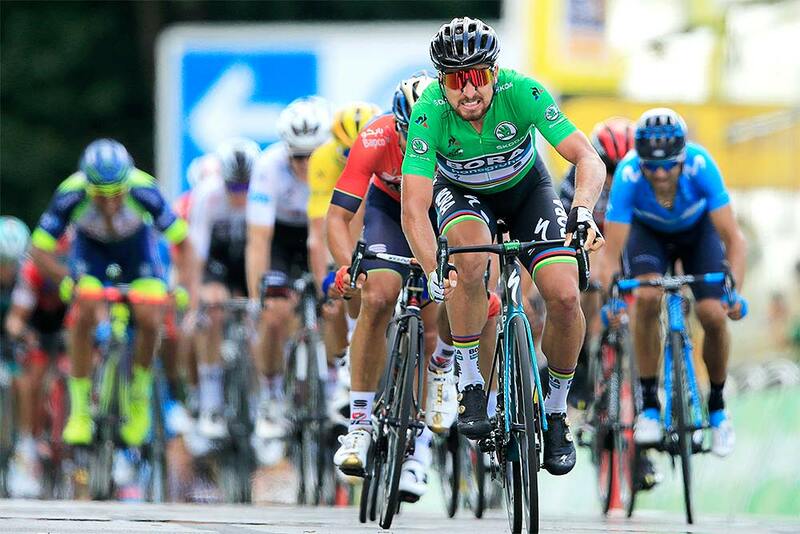 Slovakia's Peter Sagan, wearing the best sprinter's green jersey, rides in the pack during during the fifth stage of the Tour de France cycling race over 204.5 kilometers (127 miles) with start in Lorient and finish in Quimper, France. 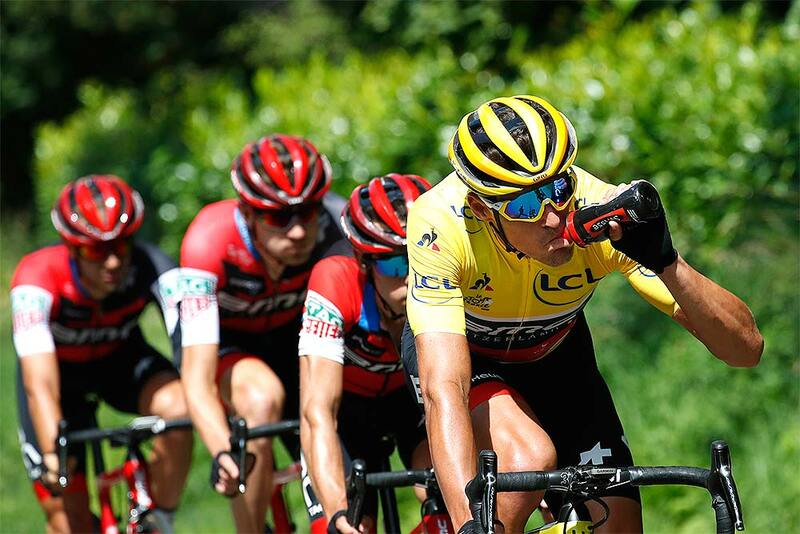 Belgium's Greg van Avermaet, wearing the overall leader's yellow jersey, drinks as he rides with his teammates during the fifth stage of the Tour de France cycling race over 204.5 kilometers (127 miles) with start in Lorient and finish in Quimper, France. 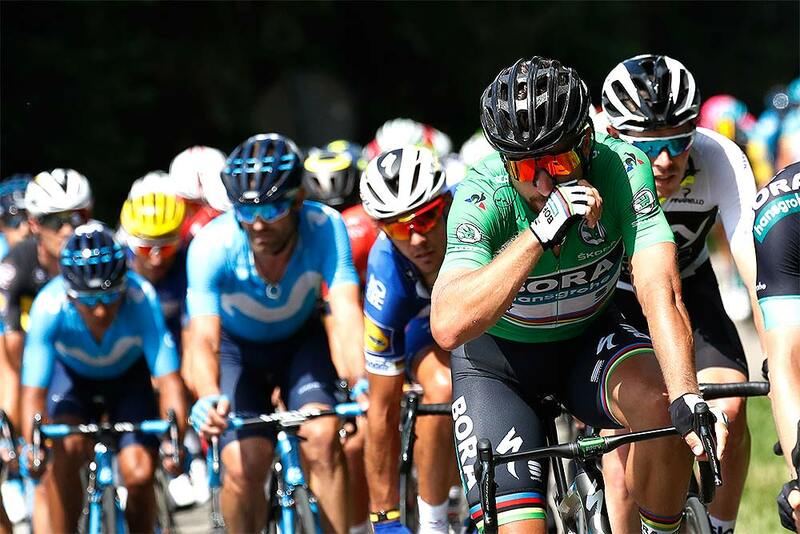 Slovakia's Peter Sagan, wearing the best sprinter's green jersey, crosses the finish line to win the fifth stage of the Tour de France cycling race over 204.5 kilometers (127 miles) with start in Lorient and finish in Quimper, France. Slovakia's Peter Sagan, wearing the best sprinter's green jersey, crosses the finish line ahead of Italy's Sonny Colbrelli, right, and Belgium's Philippe Gilbert, rear center, to win the fifth stage of the Tour de France cycling race over 204.5 kilometers (127 miles) with start in Lorient and finish in Quimper, France. 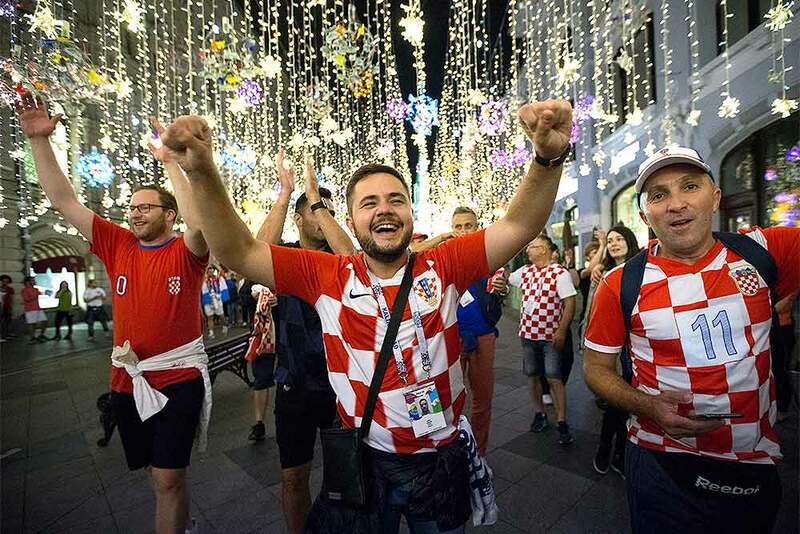 Croatian fans cheer while watching the semifinal match between Croatia and England at the 2018 soccer World Cup, in Zagreb, Croatia. 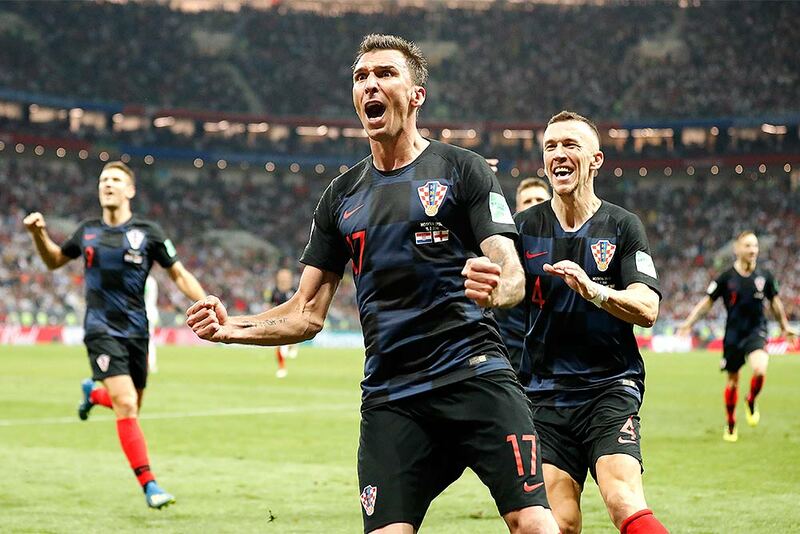 Croatia's Mario Mandzukic celebrates after scoring his side's second goal during the semifinal match between Croatia and England at the 2018 soccer World Cup in the Luzhniki Stadium in Moscow, Russia. 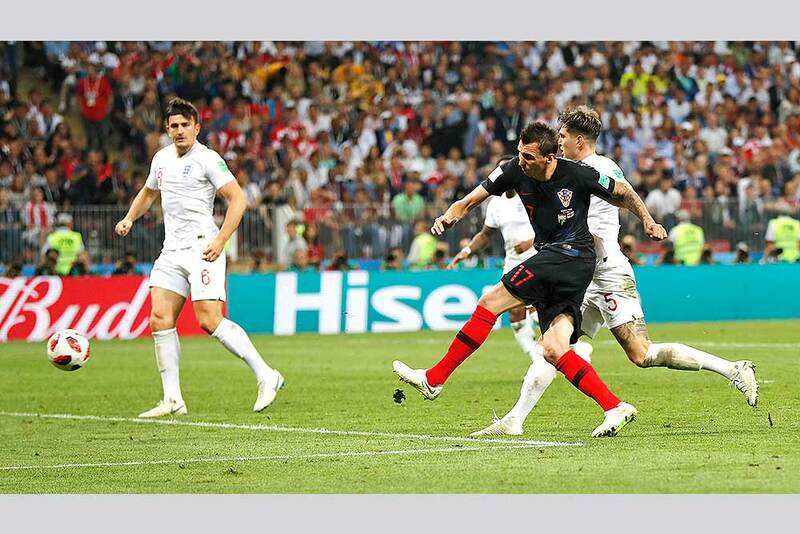 Croatia's Mario Mandzukic, 2nd right, scores his side's second goal during the semifinal match between Croatia and England at the 2018 soccer World Cup in the Luzhniki Stadium in Moscow, Russia. Croatia's Mario Mandzukic, second right, scores his side's second goal during the semifinal match between Croatia and England at the 2018 soccer World Cup in the Luzhniki Stadium in Moscow, Russia. England players react after Croatia scored their second goal during the semifinal match between Croatia and England at the 2018 soccer World Cup in the Luzhniki Stadium in Moscow, Russia. 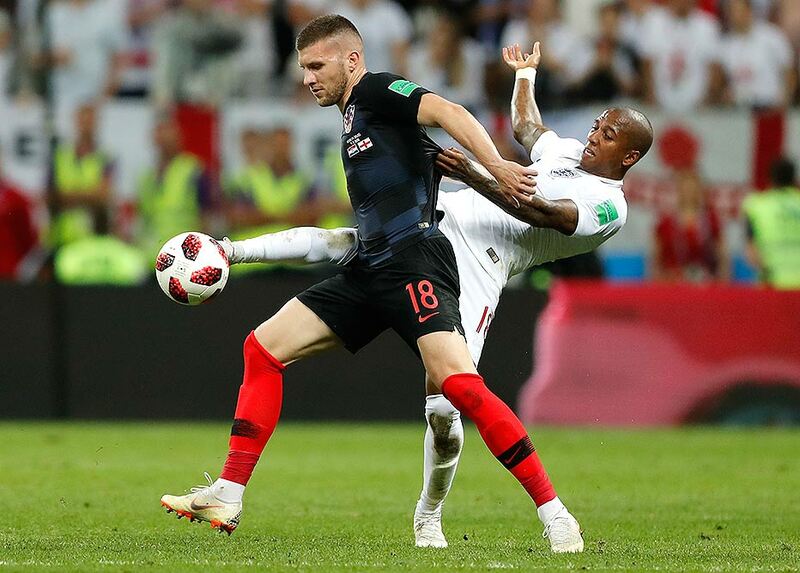 Croatia's Ante Rebic, front, and England's Ashley Young challenge for the ball during the semifinal match between Croatia and England at the 2018 soccer World Cup in the Luzhniki Stadium in Moscow, Russia. England's Harry Kane, left, plays the ball against the goal post during the semifinal match between Croatia and England at the 2018 soccer World Cup in the Luzhniki Stadium in Moscow, Russia. 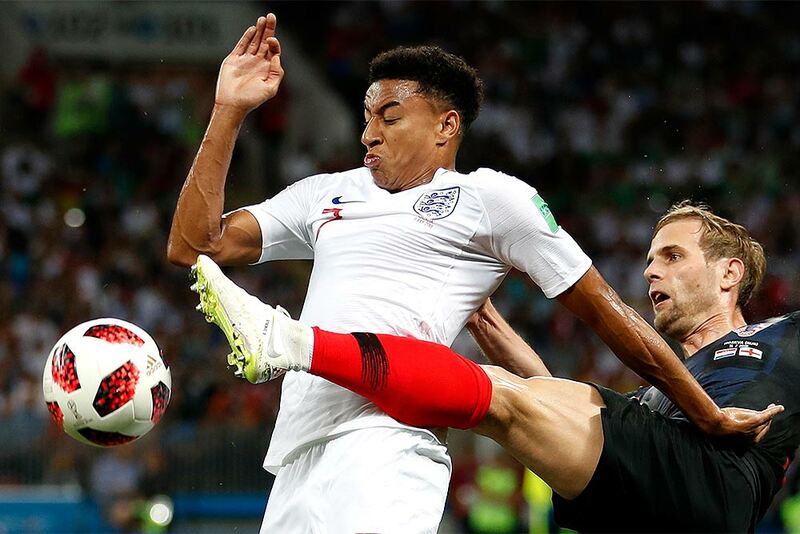 Croatia's Ivan Strinic, right, challenges for the ball England's Jesse Lingard, left, during the semifinal match between Croatia and England at the 2018 soccer World Cup in the Luzhniki Stadium in Moscow, Russia. Croatia goalkeeper Danijel Subasic saves a shot from England's Harry Kane, left, during the semifinal match between Croatia and England at the 2018 soccer World Cup in the Luzhniki Stadium in Moscow, Russia. Croatia's Ivan Perisic, 2nd right, scores his side's first goal during the semifinal match between Croatia and England at the 2018 soccer World Cup in the Luzhniki Stadium in Moscow, Russia. 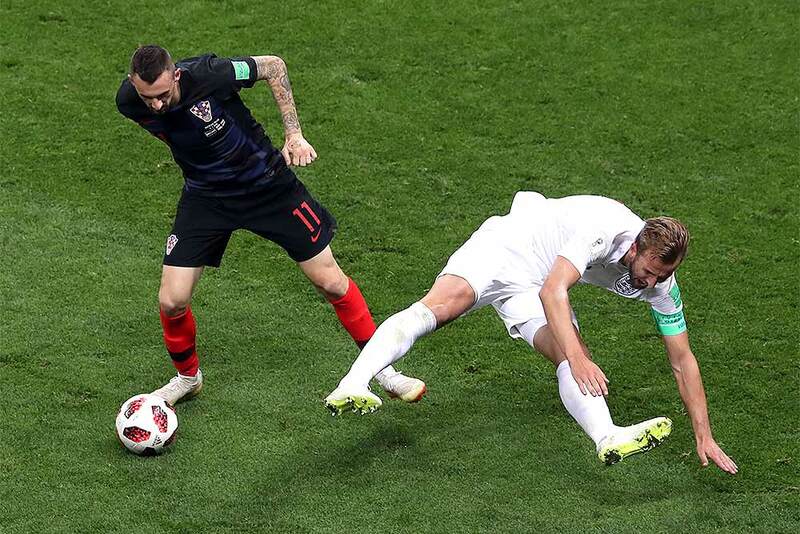 Croatia's Marcelo Brozovic fights for the ball with England's Harry Kane, right, during the semifinal match between Croatia and England at the 2018 soccer World Cup in the Luzhniki Stadium in Moscow, Russia. 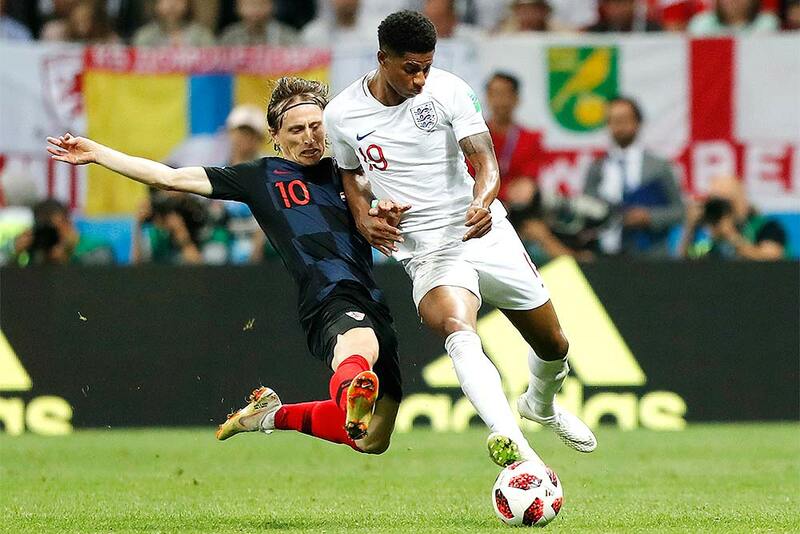 Croatia's Luka Modric, left, and England's Marcus Rashford challenge for the ball during the semifinal match between Croatia and England at the 2018 soccer World Cup in the Luzhniki Stadium in Moscow, Russia. 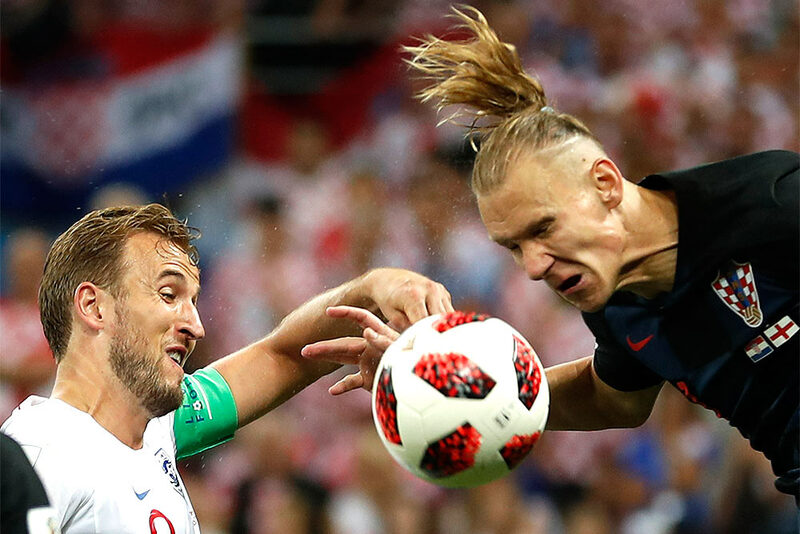 Croatia's Domagoj Vida, right, challenges for the ball England's Harry Kane, left, during the semifinal match between Croatia and England at the 2018 soccer World Cup in the Luzhniki Stadium in Moscow, Russia. 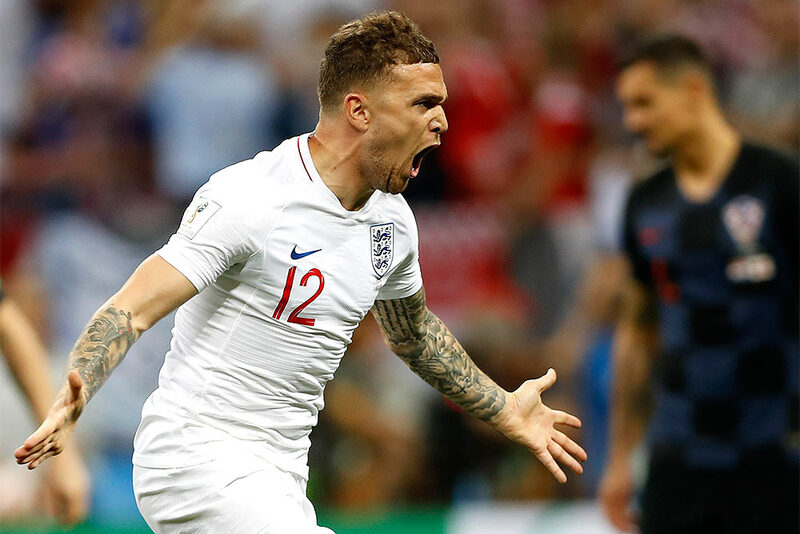 England's Kieran Trippier celebrates after scoring the opening goal during the semifinal match between Croatia and England at the 2018 soccer World Cup in the Luzhniki Stadium in Moscow, Russia. 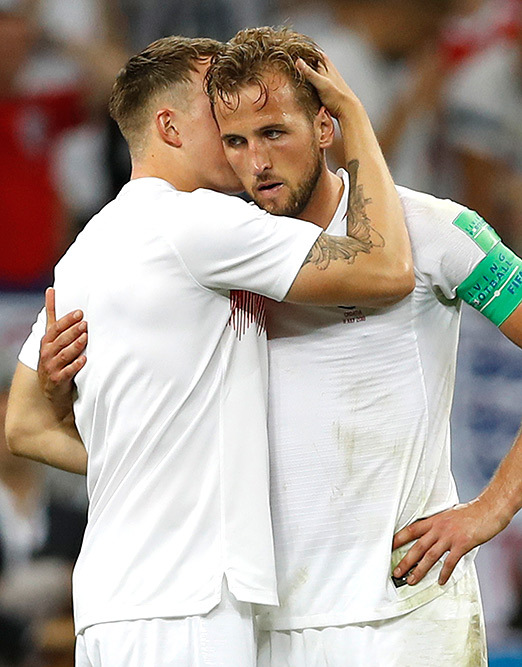 England's Phil Jones hugs with England's Harry Kane, right, during the semifinal match between Croatia and England at the 2018 soccer World Cup in the Luzhniki Stadium in Moscow, Russia. 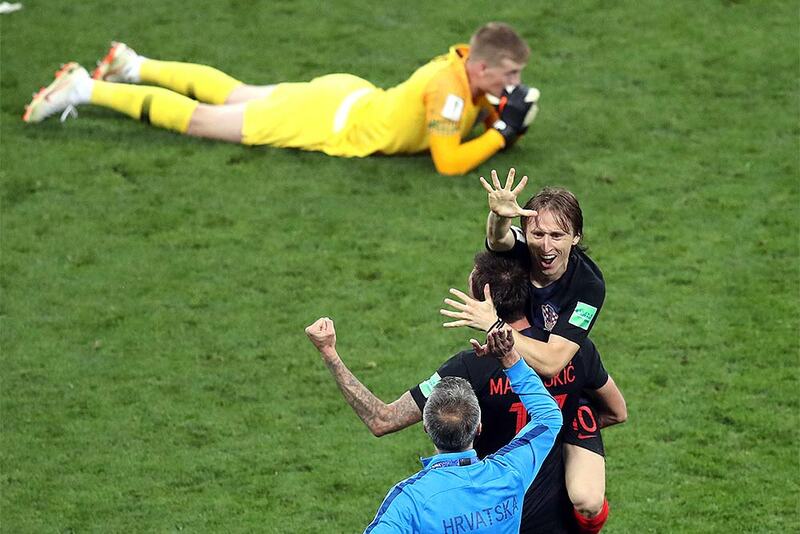 Croatia's Luka Modric, right, celebrates next to England goalkeeper Jordan Pickford, on the ground, at the end of the semifinal match between Croatia and England at the 2018 soccer World Cup in the Luzhniki Stadium in Moscow, Russia. 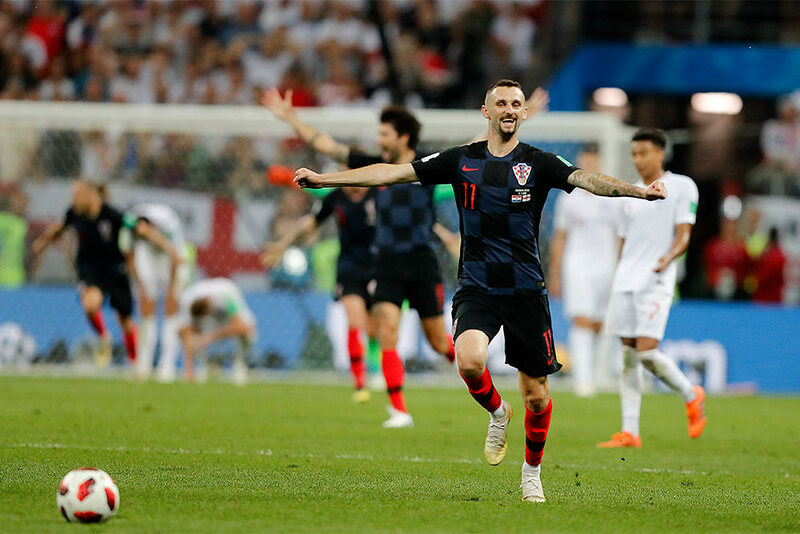 Croatia's Marcelo Brozovic celebrates after his team advanced to the final during the semifinal match between Croatia and England at the 2018 soccer World Cup in the Luzhniki Stadium in Moscow, Russia. 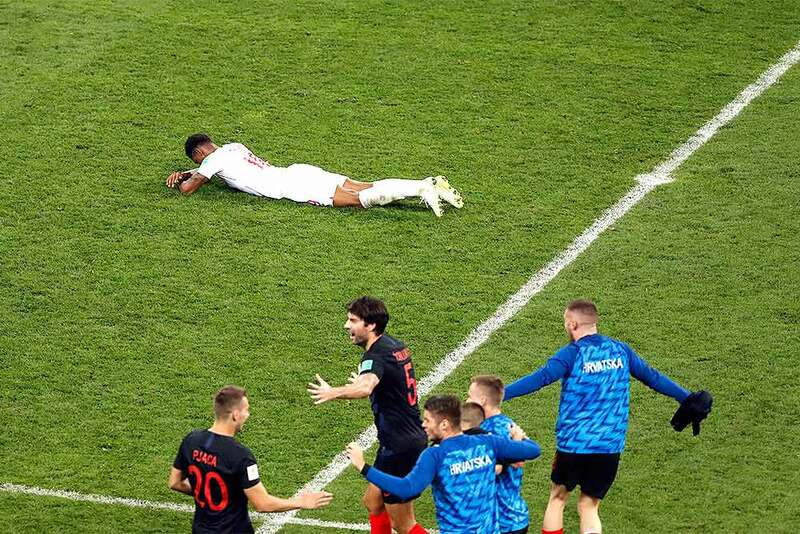 England's Marcus Rashford reacts on the pitch disappointed after losing the semifinal match between Croatia and England at the 2018 soccer World Cup in the Luzhniki Stadium in Moscow, Russia. 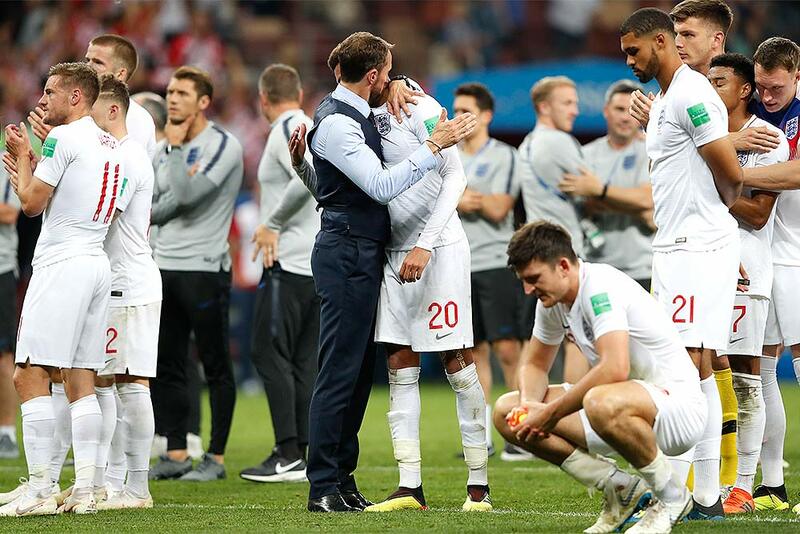 England head coach Gareth Southgate, left, embraces England's Dele Alli at the end of the semifinal match between Croatia and England at the 2018 soccer World Cup in the Luzhniki Stadium in Moscow, Russia. 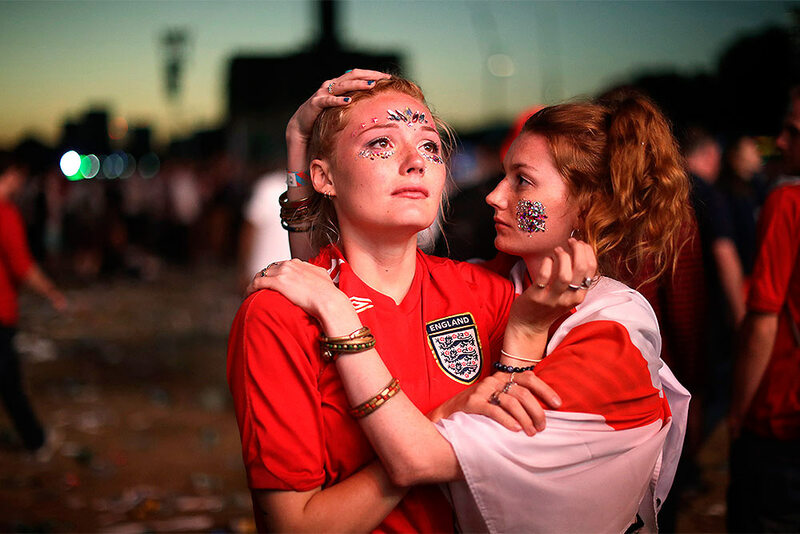 England soccer fans react after England national soccer team lost the semifinal match between Croatia and England at the 2018 soccer World Cup, in Hyde Park, London. 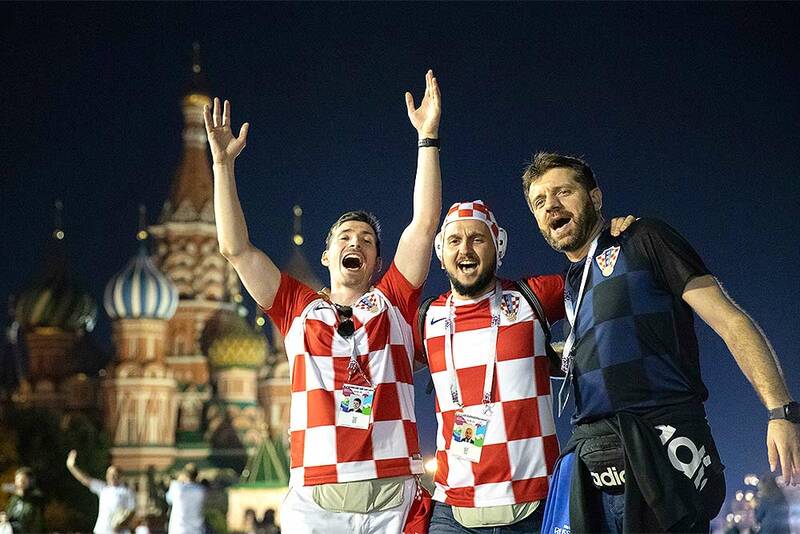 Croatia fans celebrate their team victory after the semifinal soccer match between Croatia and England during the 2018 soccer World Cup in Nikolskaya street near the Kremlin in Moscow, Russia. Croatia's soccer fans celebrate with a model of the World Cup trophy in Red Square as their team won the semifinal soccer match between Croatia and England during the 2018 soccer World Cup at the Luzhniki stadium in Moscow, Russia. The St. Basil's Cathedral is left in the background. Canadian country and pop star Shania Twain, center, performs at the TD Garden in Boston, during her Shania Now Tour. 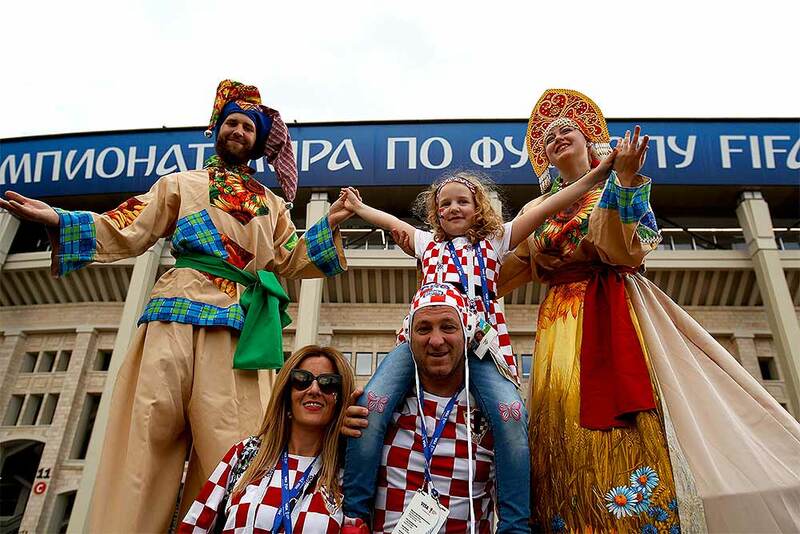 Croatia fans pose for a picture before the semifinal match between Croatia and England at the 2018 soccer World Cup in the Luzhniki Stadium in Moscow, Russia. Brazilian soccer player Arthur Melo gestures upon his arrival at the club's office at the Camp Nou stadium in Barcelona, Spain. 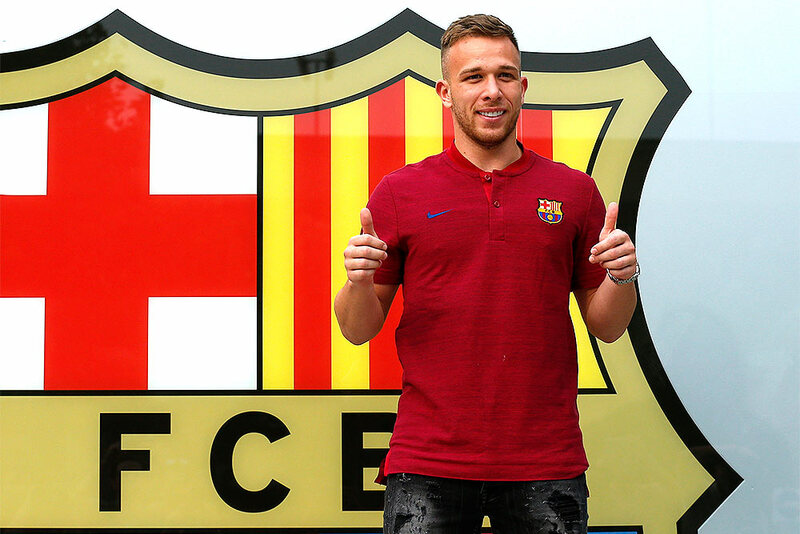 Arthur has signed a six-year deal. 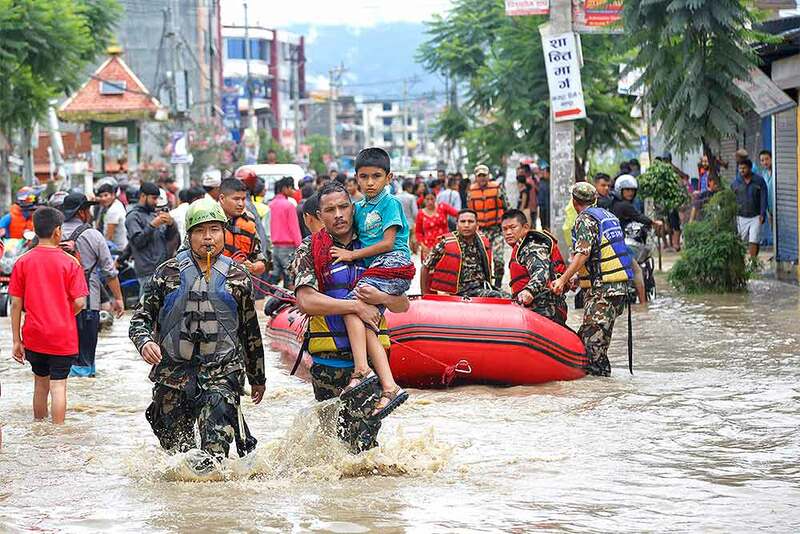 Nepalese army men rescue a sick boy from a flooded area in Bhaktapur, Nepal. The flooding was caused by overflowing of the Hanumante River following heavy rain. 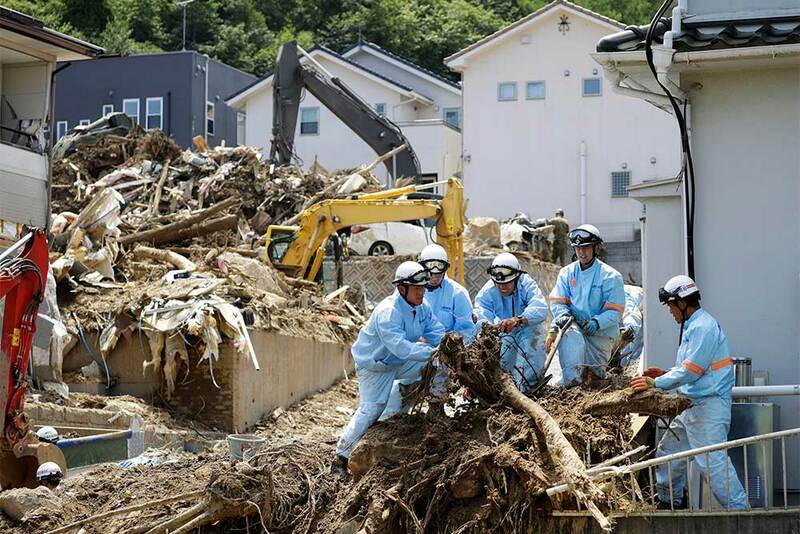 Rescuers remove driftwood from a residential area after flooding caused by heavy rains hit Kumano town, Hiroshima prefecture, southwestern Japan. Heavy rain last week triggered widespread flooding and landslides in southwestern Japan. 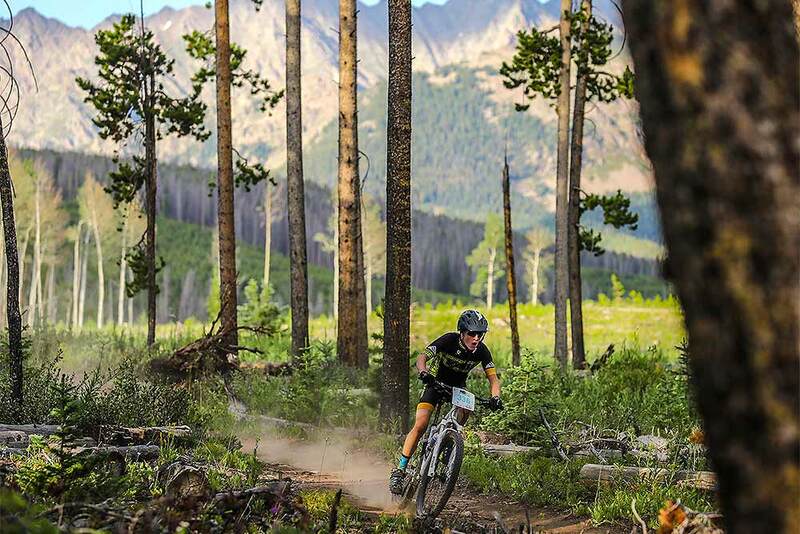 Cole Weathers flies through Lost Lake Trail during the Vail Recreation District's Lost Lake Loop as part of its Mountain Bike Race Series in Vail, Colorado. 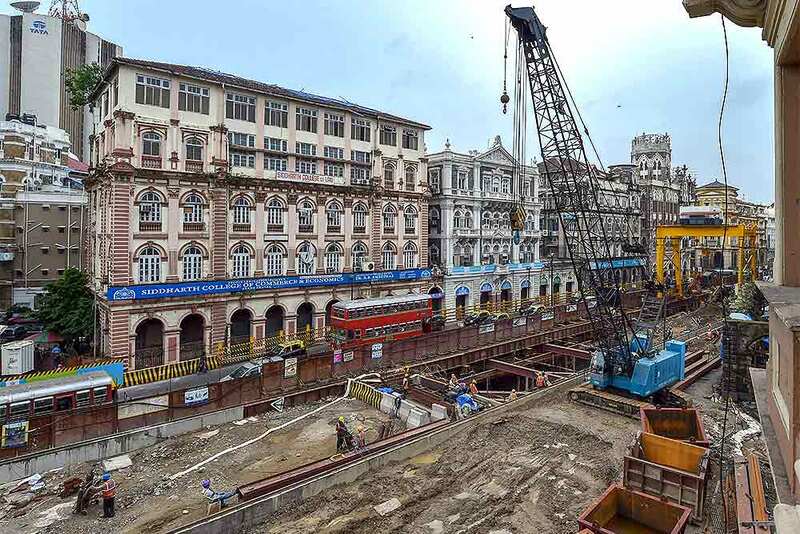 A view of the construction site of an underground metro station at DN Road, Fort in Mumbai. 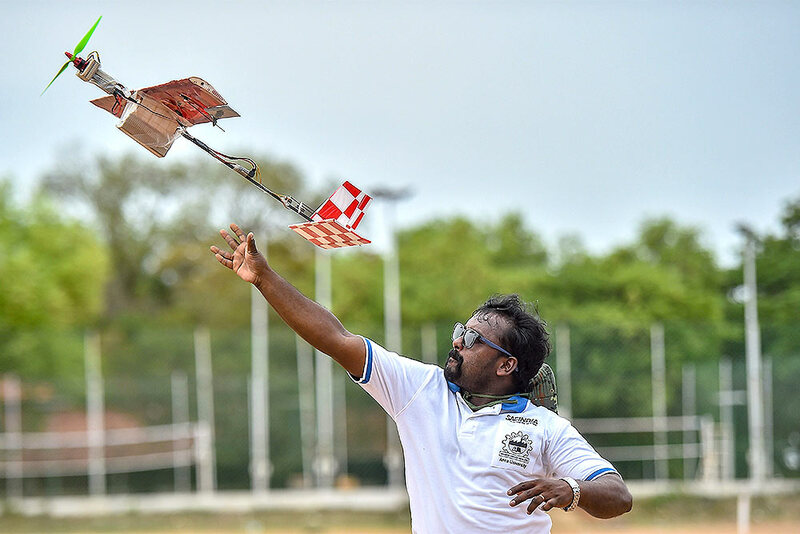 Students showcase their unmanned aerial vehicles (drones) during the Aero Design Challenge 2018 at the College of Engineering, Anna University, in Chennai. The three-day aims to encourage students at the college and university level to create unmanned aerial vehicles. 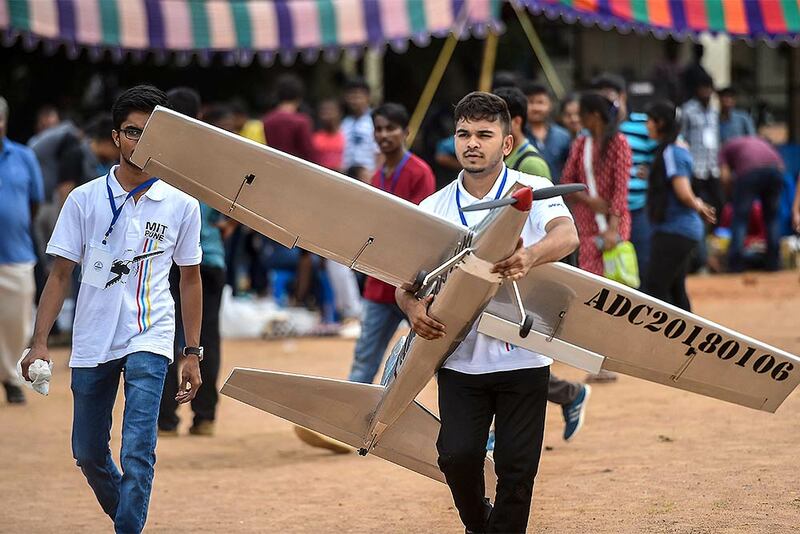 Students prepare to showcase their unmanned aerial vehicles (drones) during the Aero Design Challenge 2018 at the College of Engineering, Anna University, in Chennai. 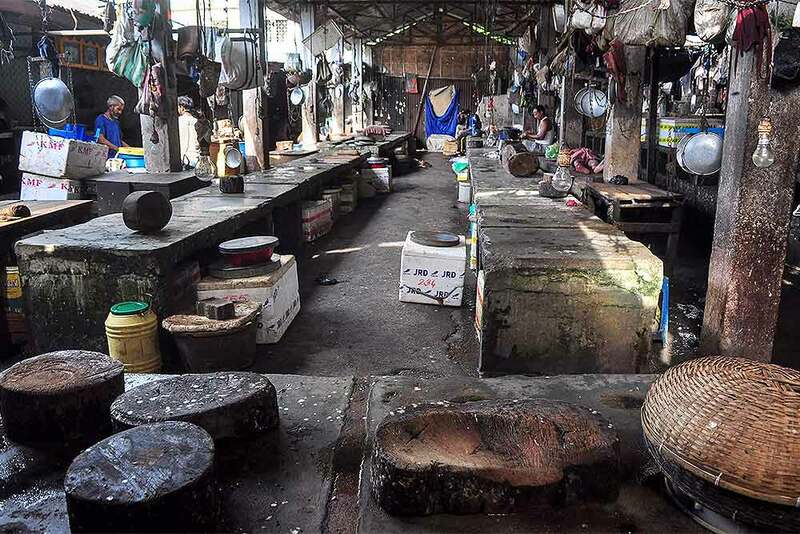 A deserted view of a retail fish market in Guwahati. The Assam government on banned import and sale of fish from other states for a period of 10 days following tests on samples that showed presence of cancer-causing chemical formalin. 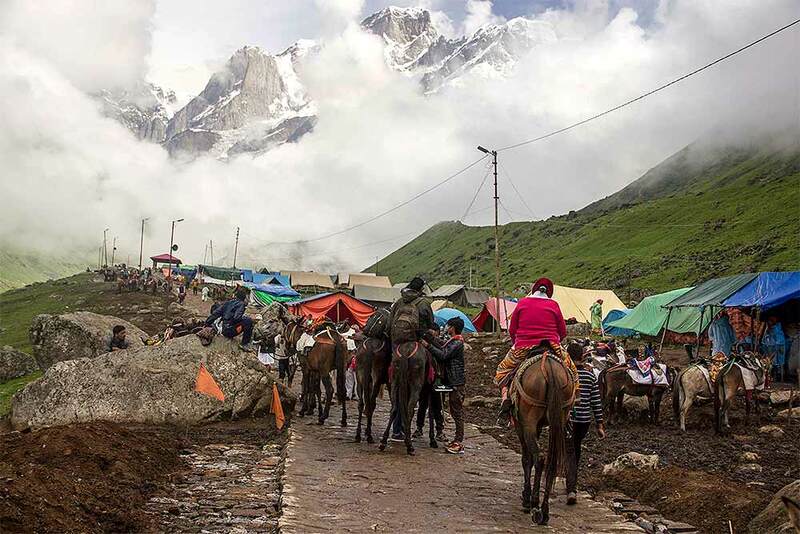 Devotees make their way to Kedarnath Temple, in Kedarnath. 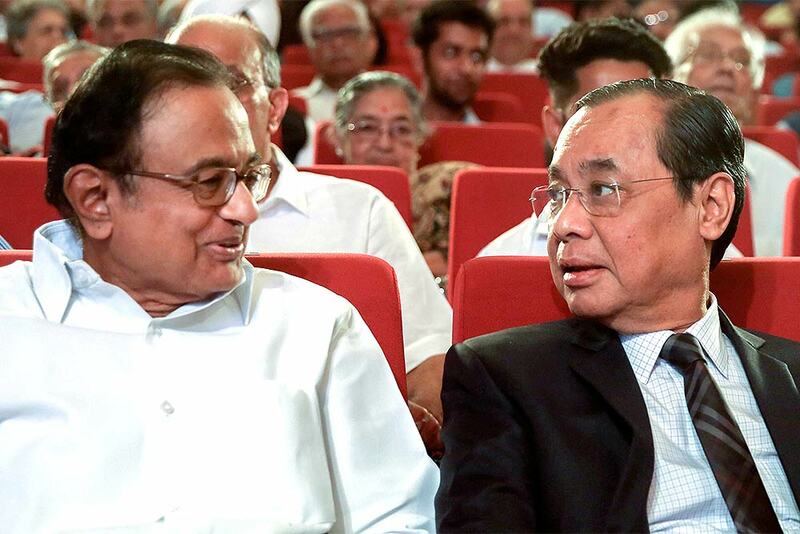 Supreme Court judge Justice Ranjan Gogoi with Congress leader and senior advocate P Chidambaram during the third Ramnath Goenka Memorial Lecture, in New Delhi. 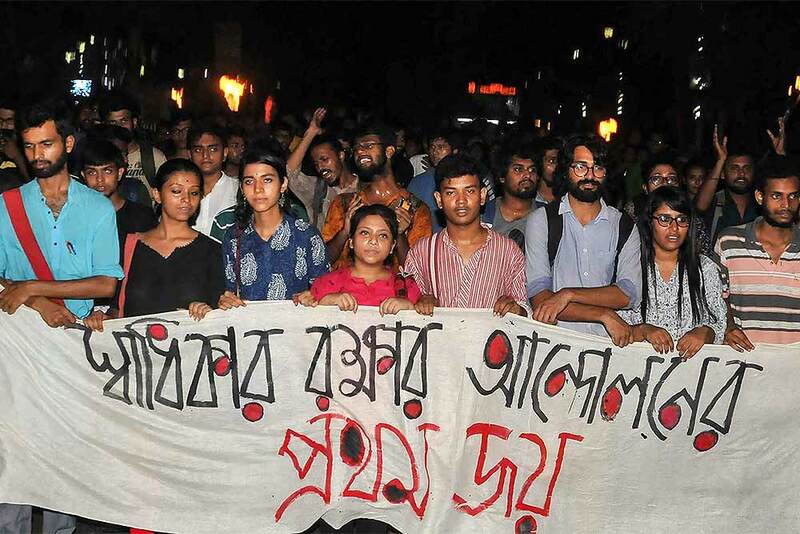 Jadavpur University students participate in a victory rally after the executive council decision reintroduced entrance test for six undergraduate courses in Humanities subjects that it had earlier scrapped at Jadavpur University, in Kolkata. 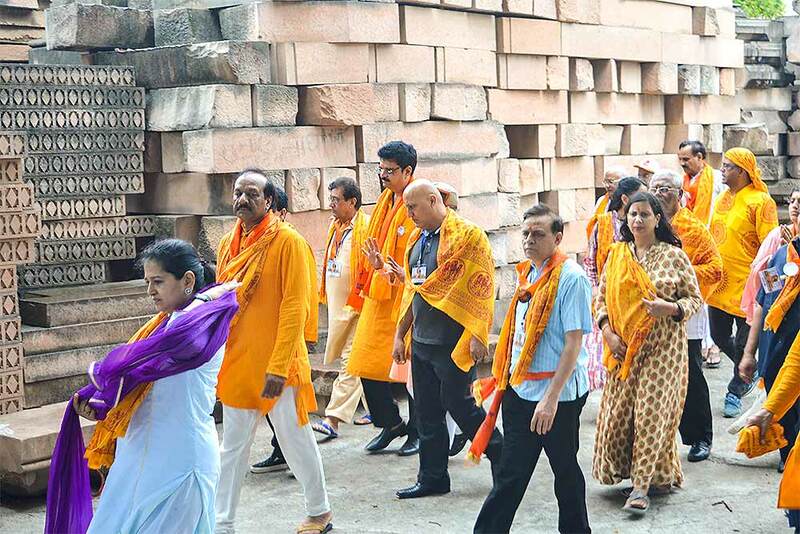 A group of 150 non-resident Indians (NRIs) from 22 countries, affiliated to the Vishva Hindu Parishad (VHP), offer prayers, in Ayodhya. 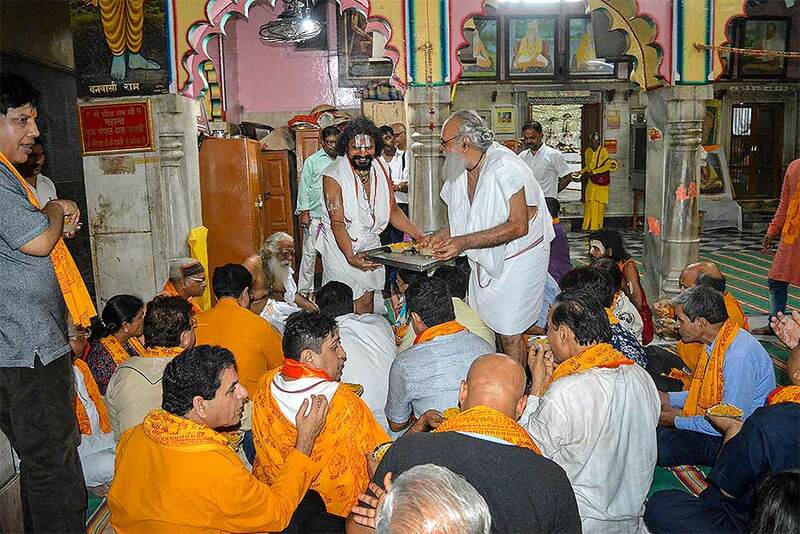 A group of 150 non-resident Indians (NRIs) from 22 countries, affiliated to the Vishva Hindu Parishad (VHP), visit and offer prayers at the makeshift Ram temple, in Ayodhya. 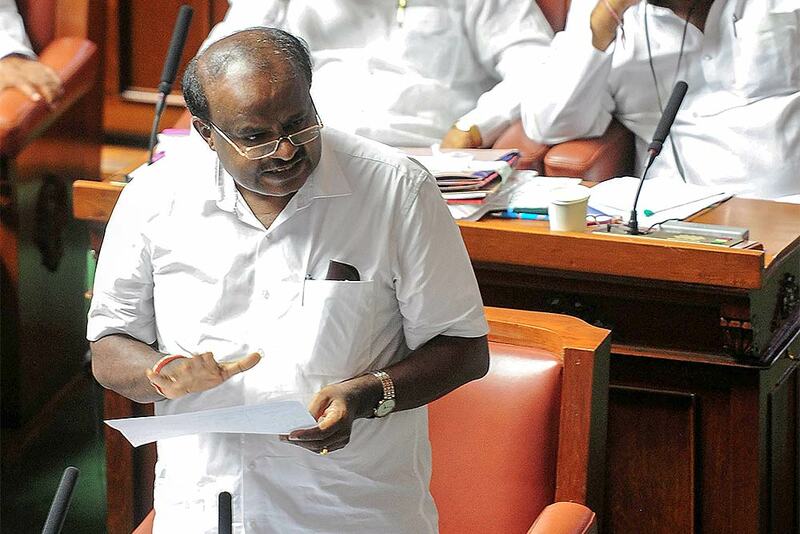 Karnataka Chief Minister H D Kumaraswamy speaks during Karnataka legislative assembly session, in Bengaluru. 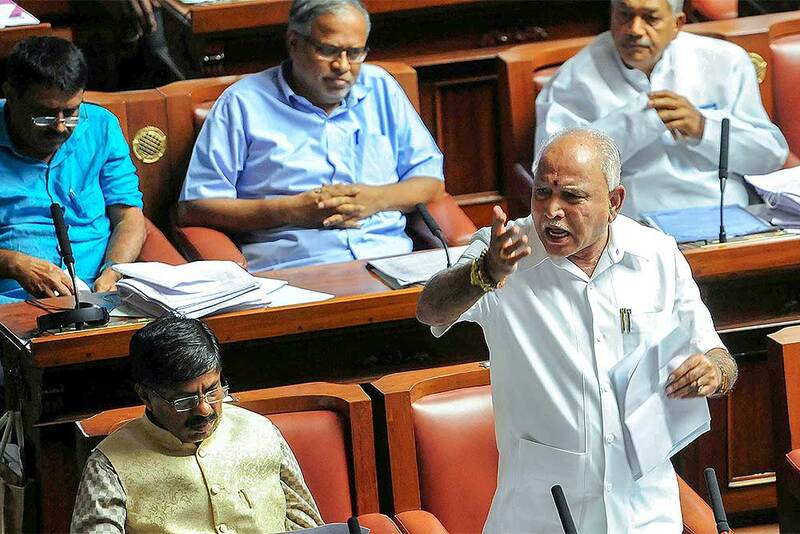 Former Karnataka Chief Minister BS Yeddyurappa speaks during Karnataka legislative assembly session, in Bengaluru. 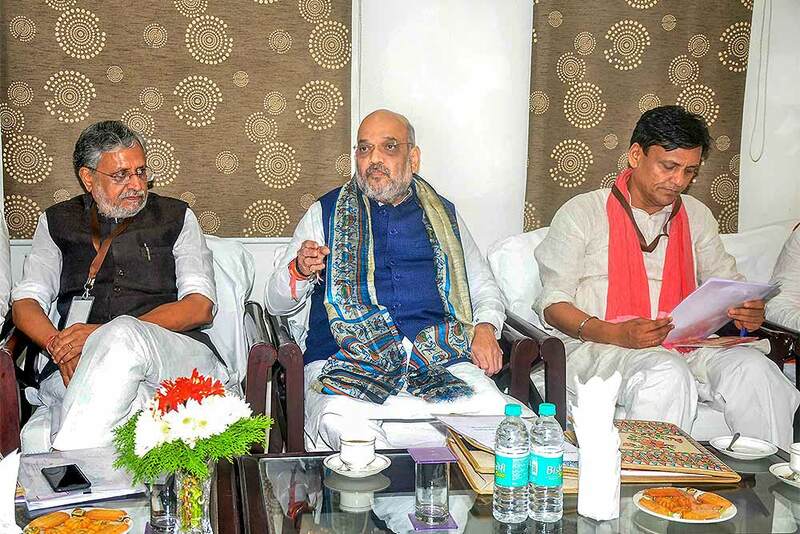 BJP President Amit Shah with Bihar Deputy Chief Minister Sushil Kumar Modi (L) and BJP state chief Nityanand Rai during a meeting at state guest house, in Patna. 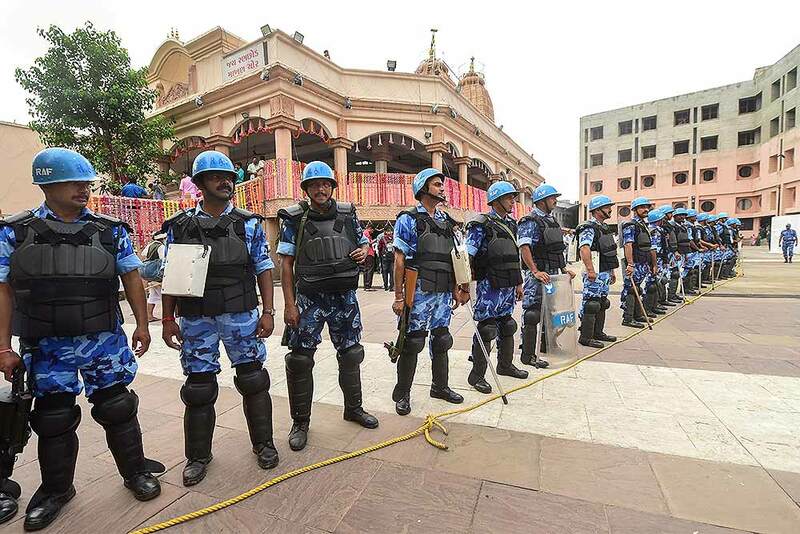 Rapid Action Force (RAF) personnel deployed ahead of annual Rath Yatra of Lord Jagannath, in Ahmadabad. 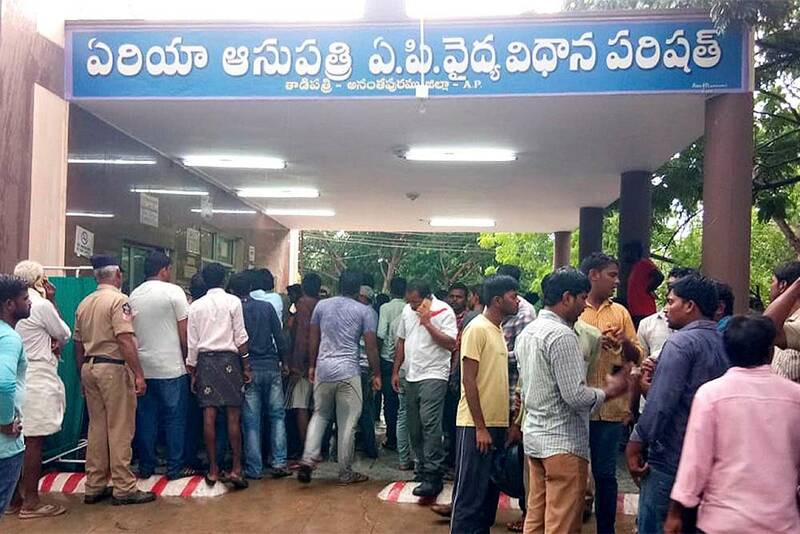 People gather at a hospital where victims of carbon monoxide gas leak at a steel plant at Tadipatri in Andhra Pradesh, were brought. 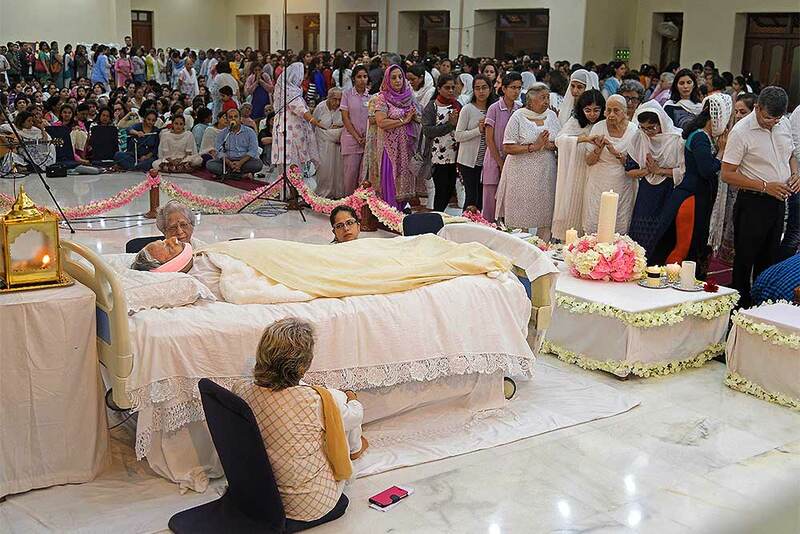 Followers pay their last respects to spiritual leader Dada J P Vaswani at Sadhu Vaswani Mission Satsang Hall, in Pune. Vaswani passed away at the age of 99. 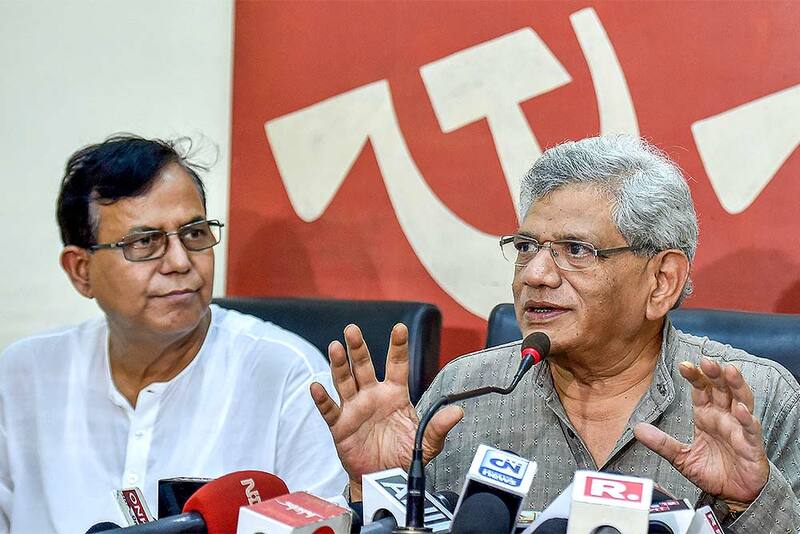 CPI(M) General Secretary Sitaram Yechury interacts with the media as party leader Mohammed Salim looks on, at party headquarter in Kolkata. 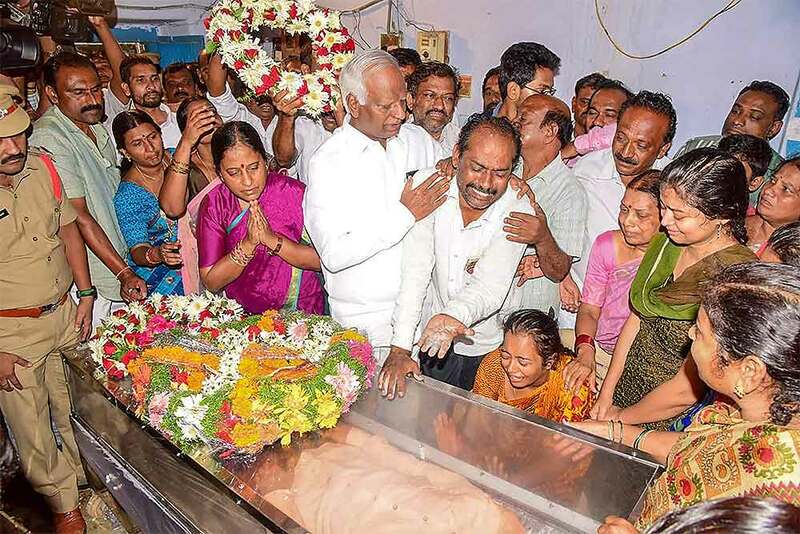 Telangana Deputy Chief Minister K Srihari consoles a family member of Sharat Koppu, a 25-year-old student who was shot dead in a restaurant in Kansas City in the US on last week, in Hyderabad. 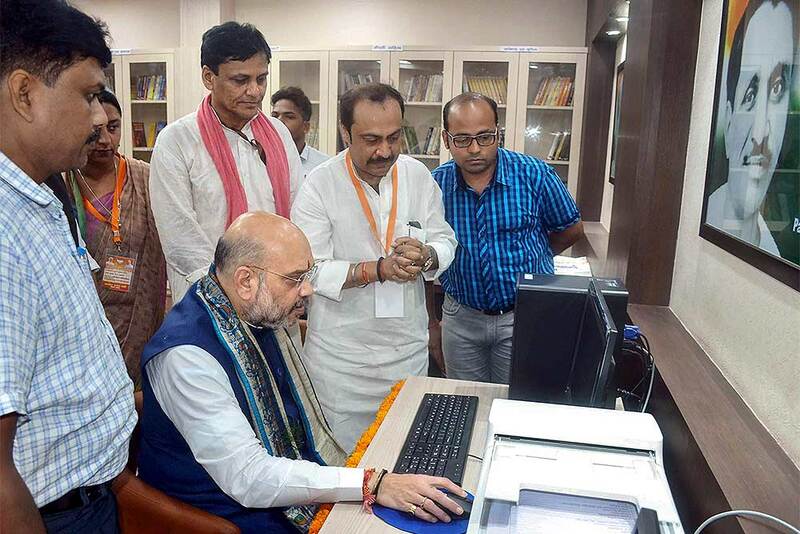 BJP President Amit Shah inaugurates the Pandit Deen Dayal Upadhyay e-library at state party office, in Patna. Also seen is BJP state chief Nityanand Rai. 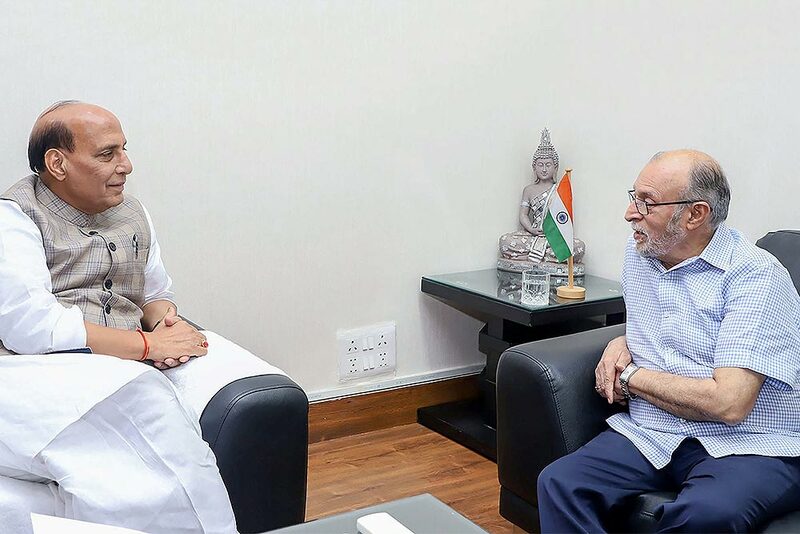 Delhi LG Anil Baijal meets Union Home Minister Rajnath Singh, in New Delhi. 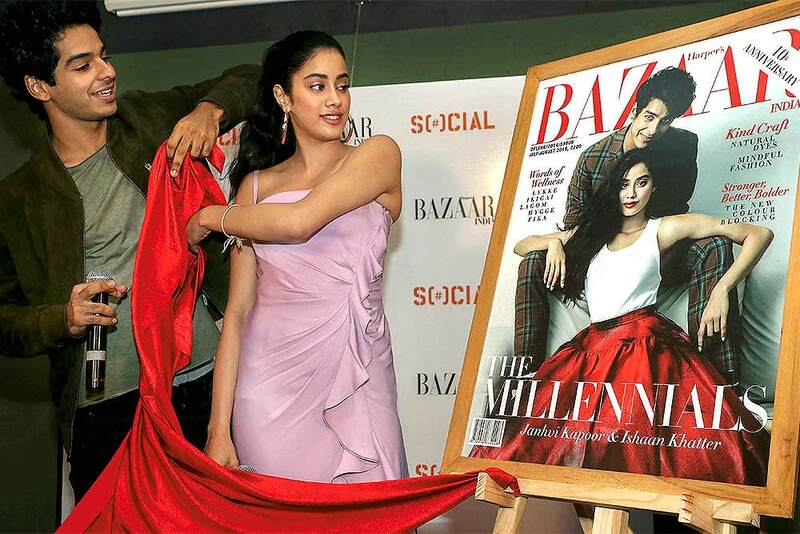 Bollywood actors Ishaan Khatter and Janhvi Kapoor during the unveiling of the Harper's Bazaar magazine's cover page and promotion of their film ‘Dhadak’, in Mumbai.